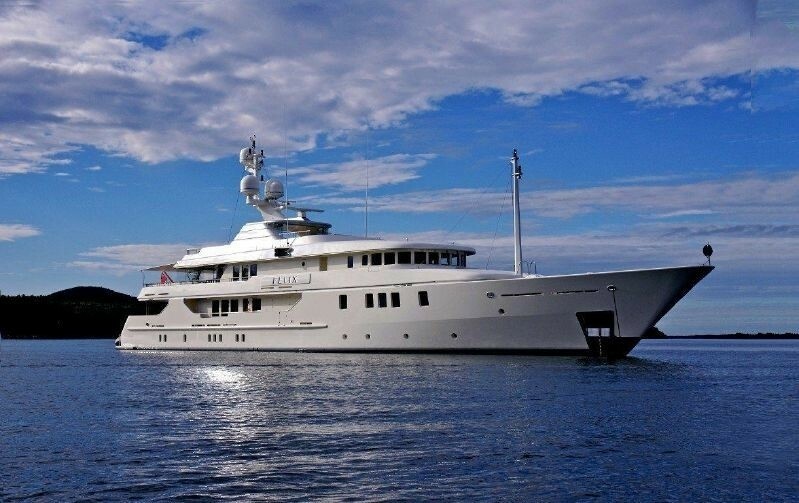 Luxury yacht NITA K II (ex Marjorie Morningstar, Lady in Blue, Felix) is 52 meter (170’) Amels motor yacht launched in 2004. 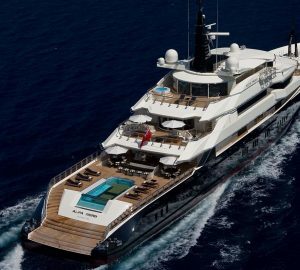 The luxury yacht NITA K II’s interior volume has been increased by extending the superstructure several meters over a well-proven 52-metre hull form. 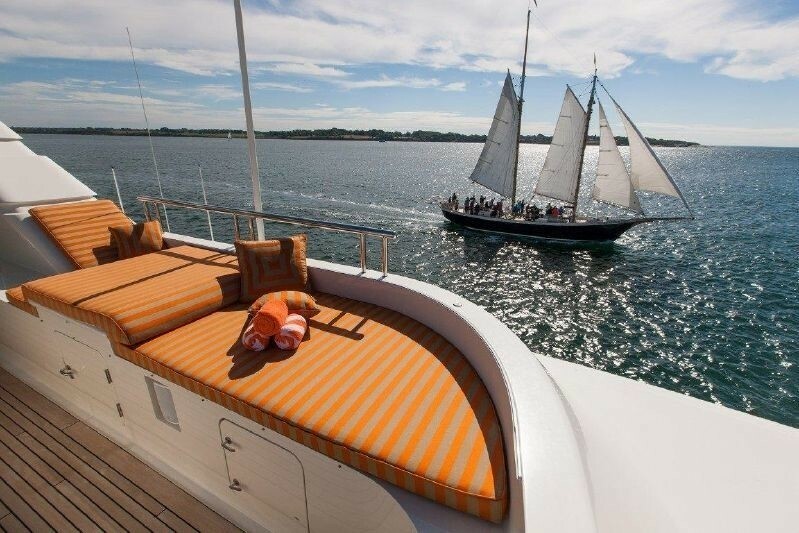 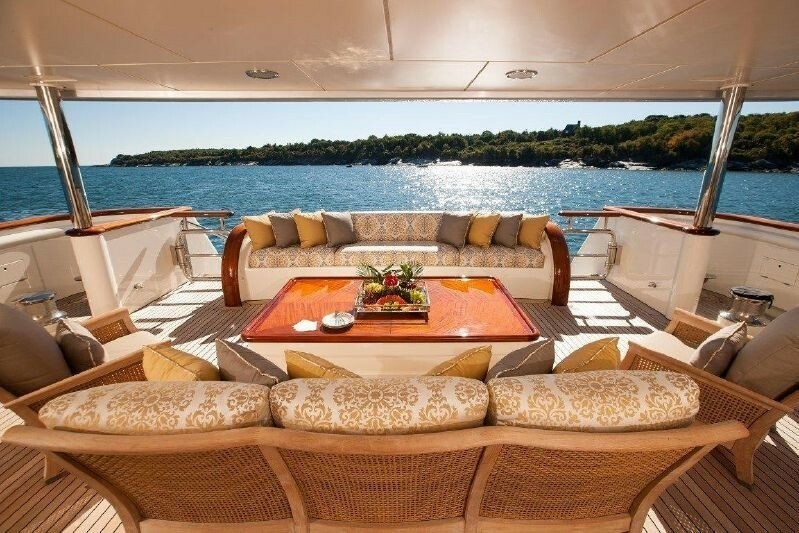 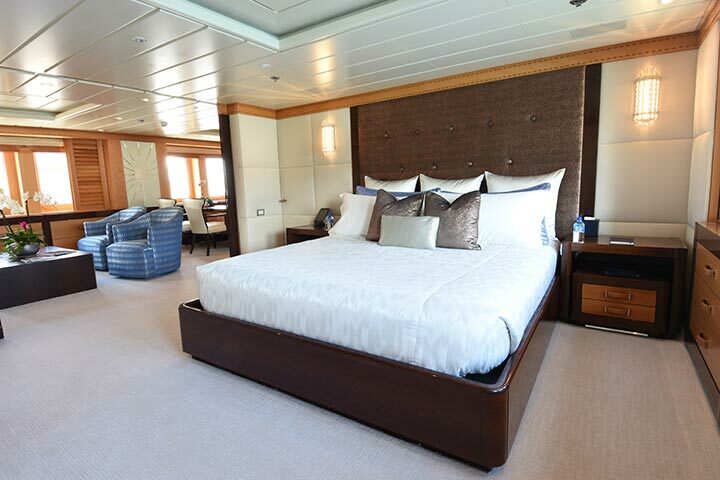 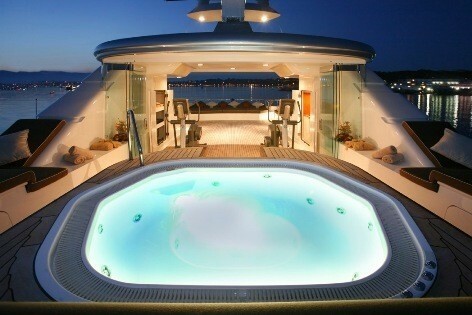 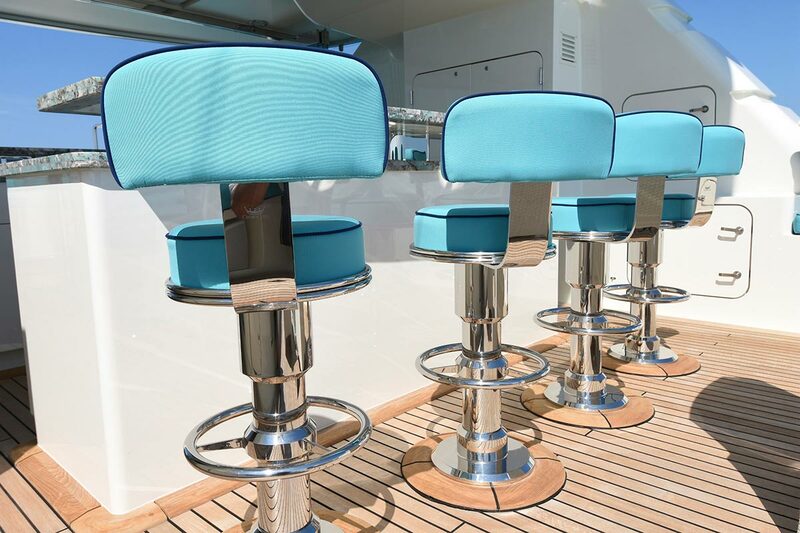 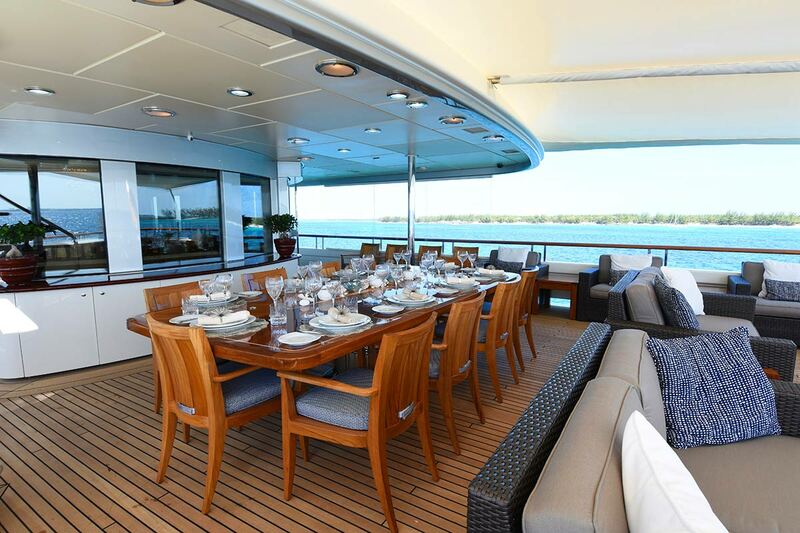 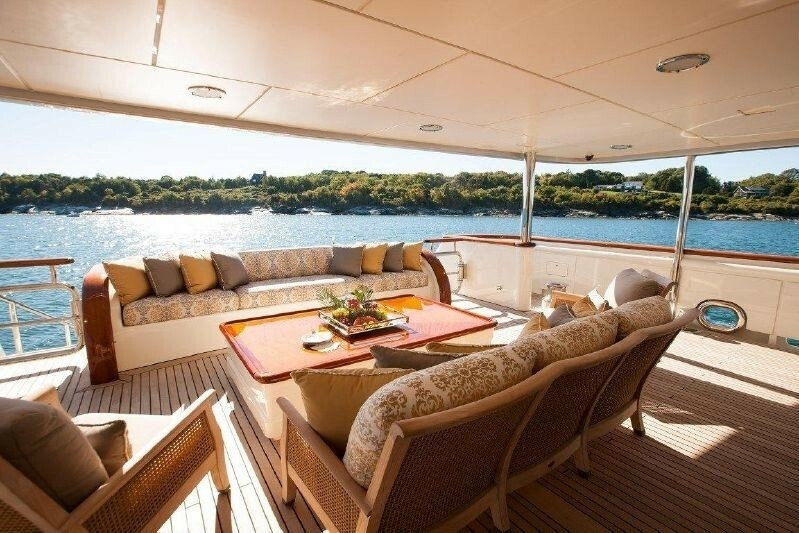 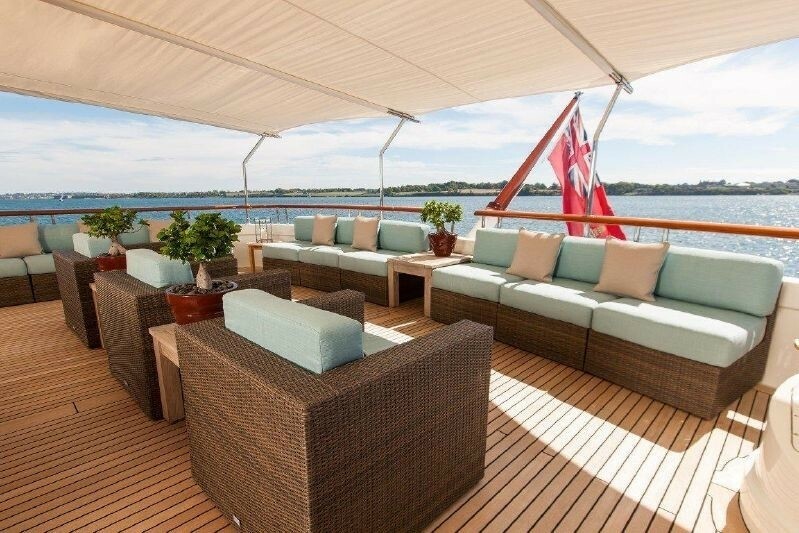 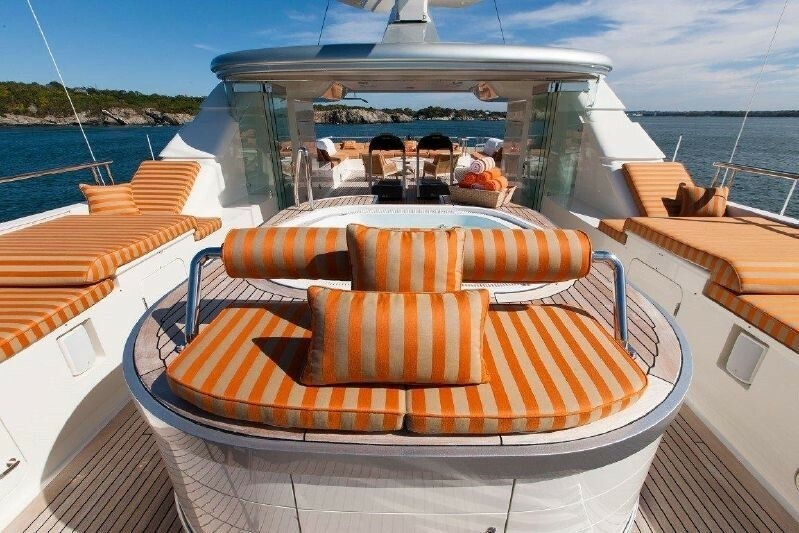 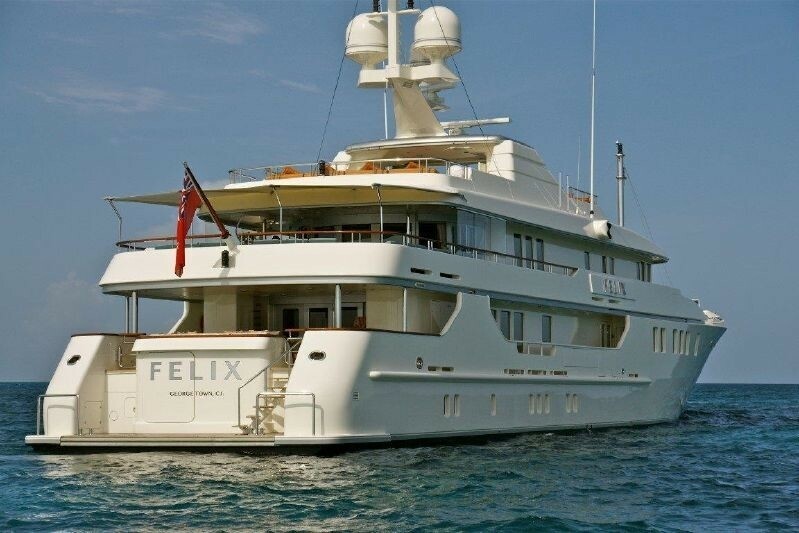 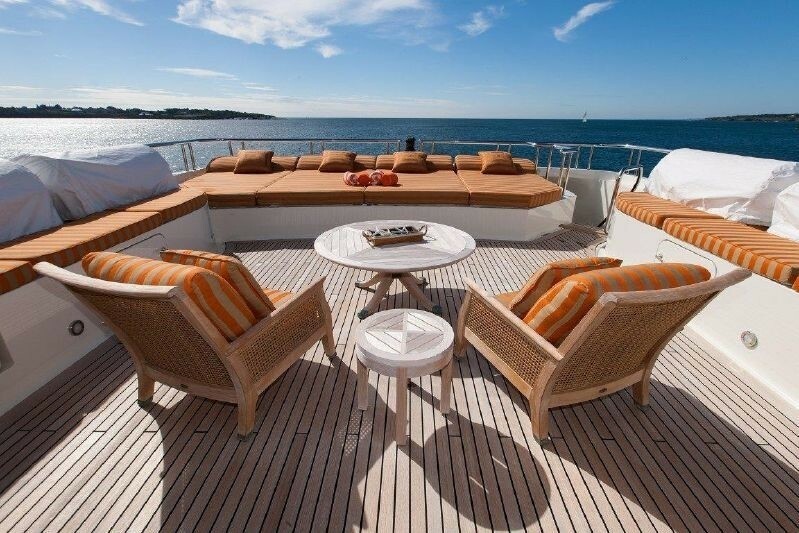 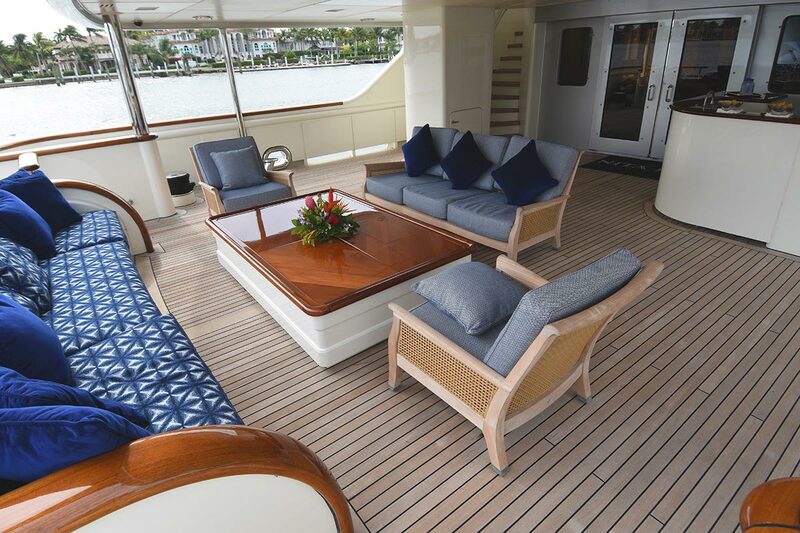 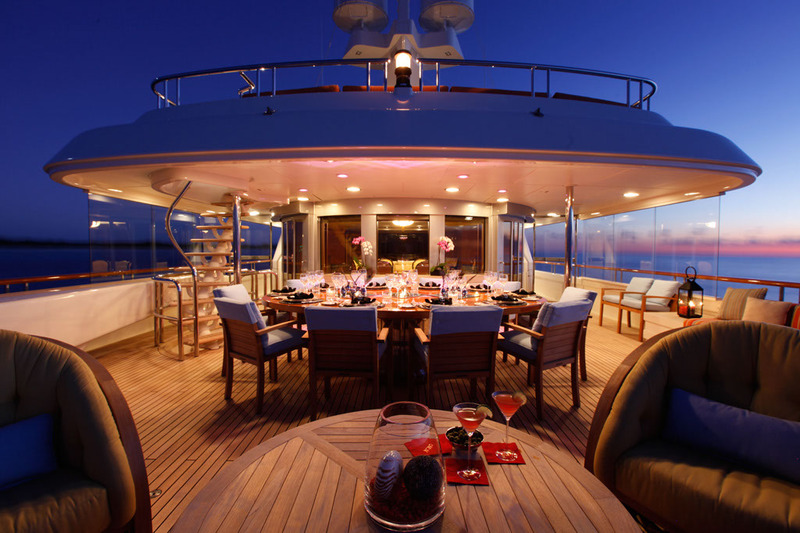 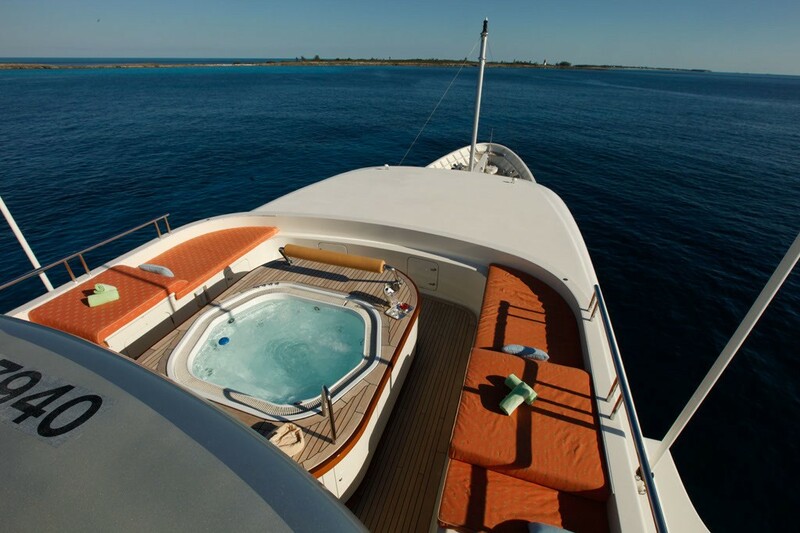 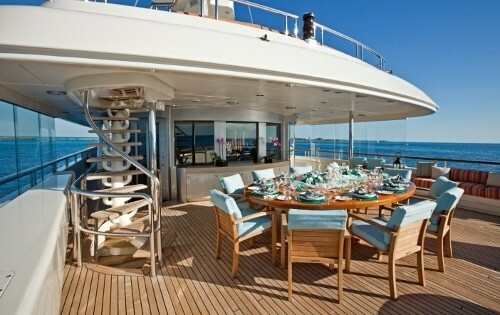 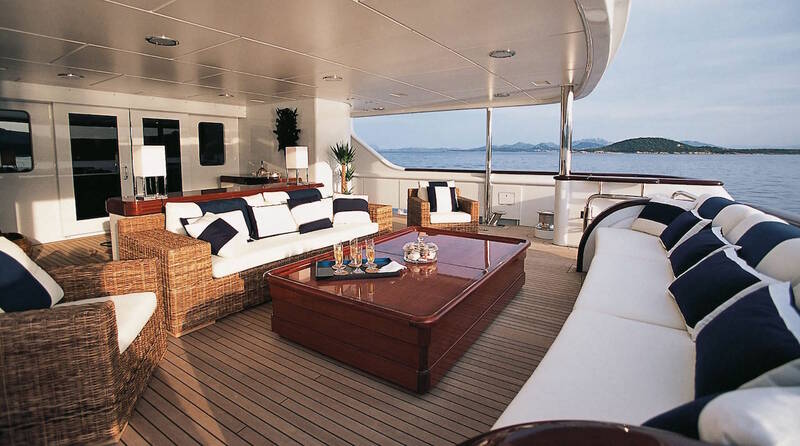 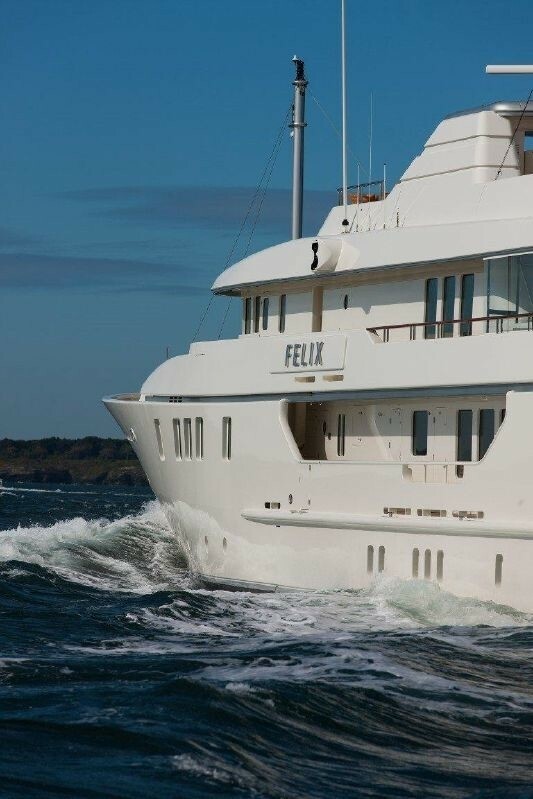 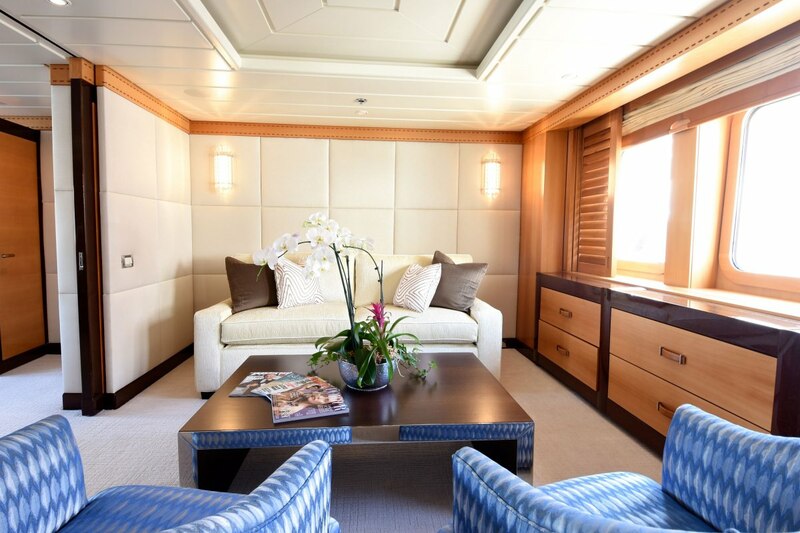 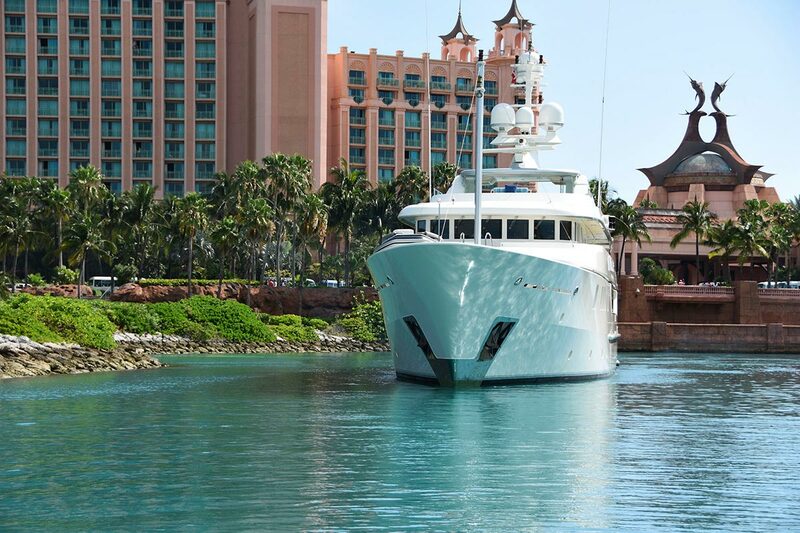 Her sundeck and after bridge deck lounge is designed to accommodate a large number of guests. 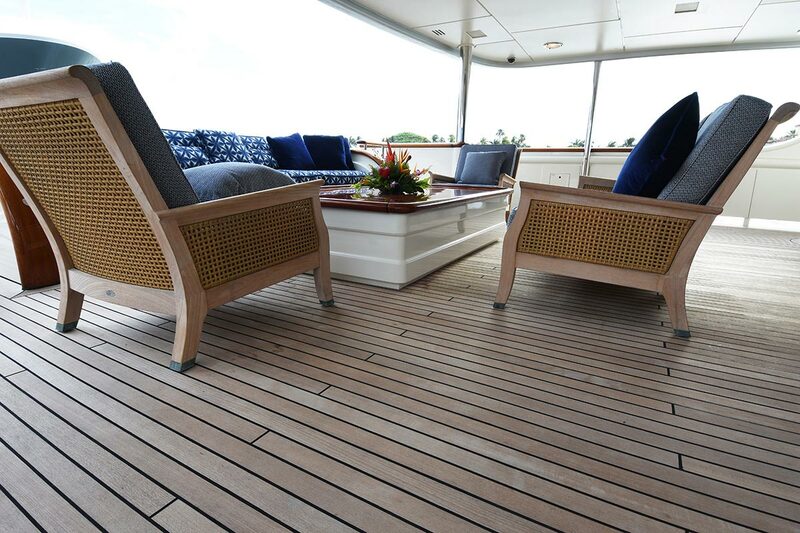 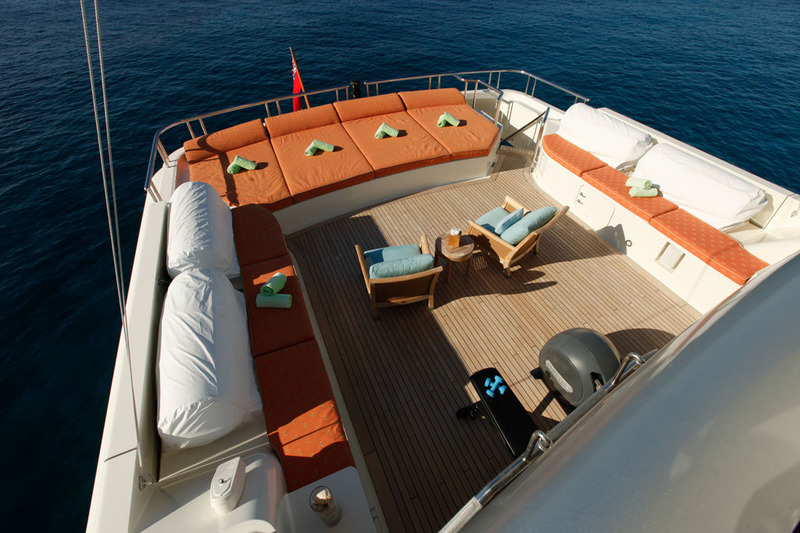 NITA K II's six-month refit in 2008 included new and larger tenders and windbreaks on her sky lounge deck. 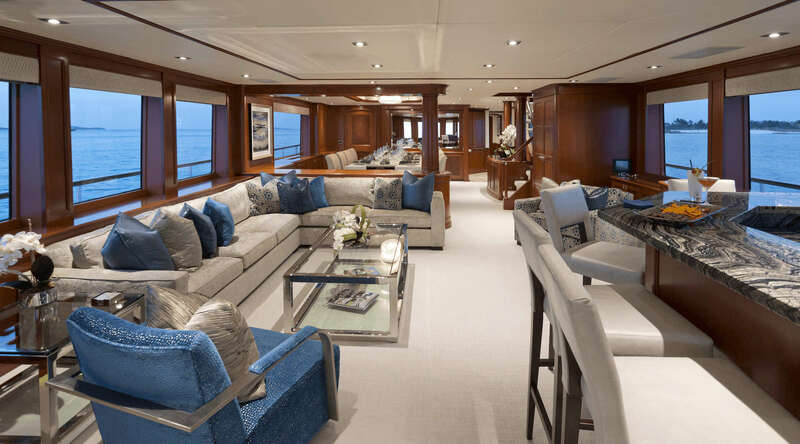 The new interior, designed by Michael Leach Designs, uses original natural materials and luxurious fabrics to create a gracious harmony highlighted by a few pieces of furniture and accessories. 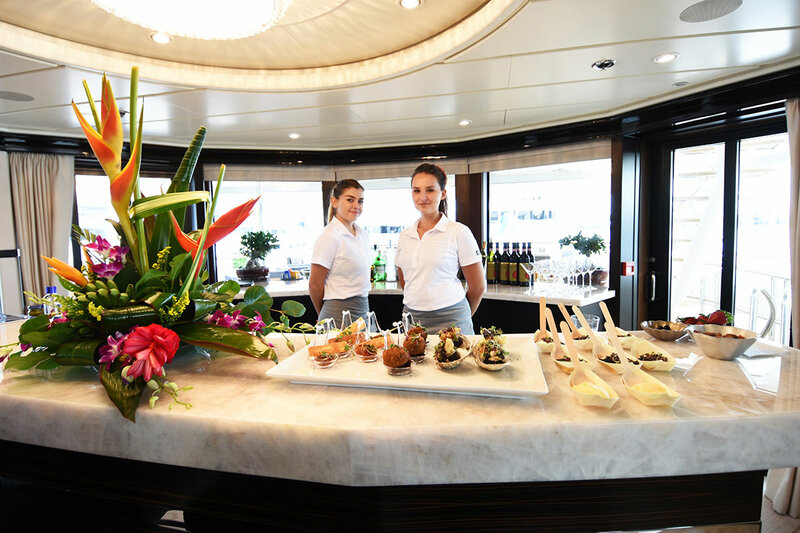 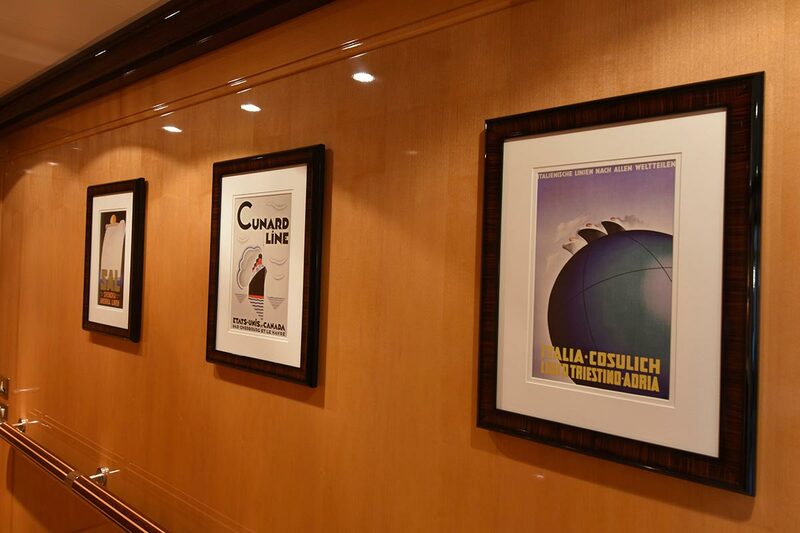 Also in the 2008 refit, the latest state of the art audio visual systems have been installed throughout as well as the brand new galley. 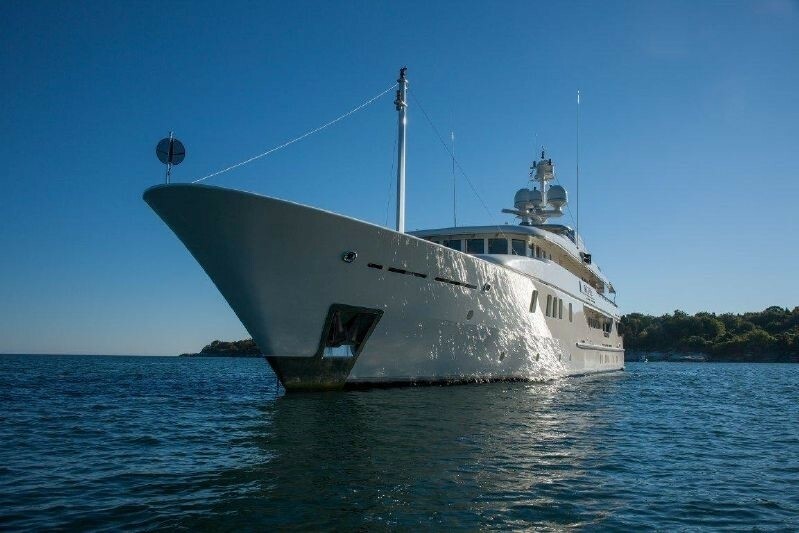 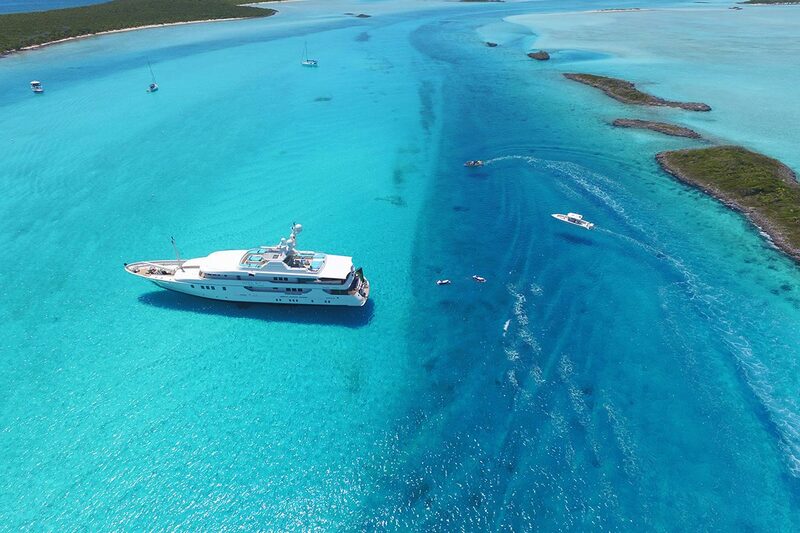 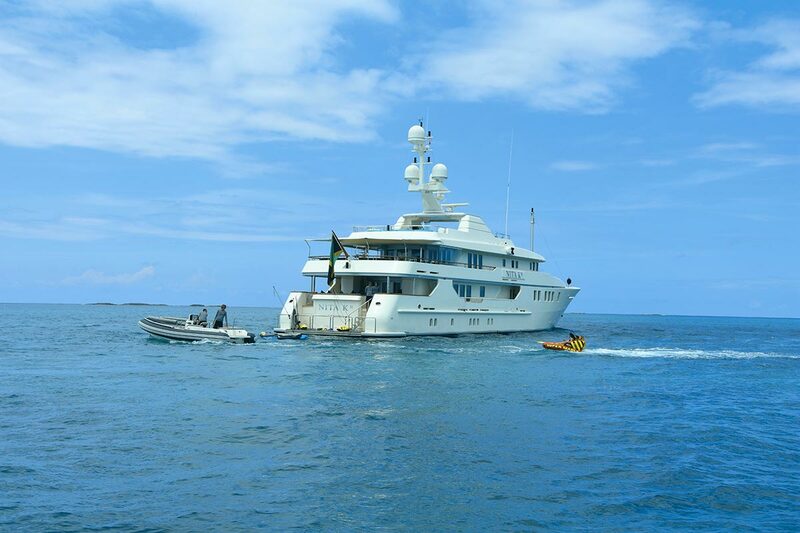 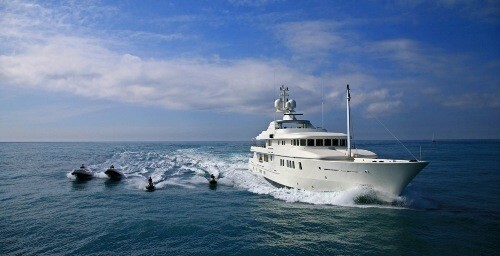 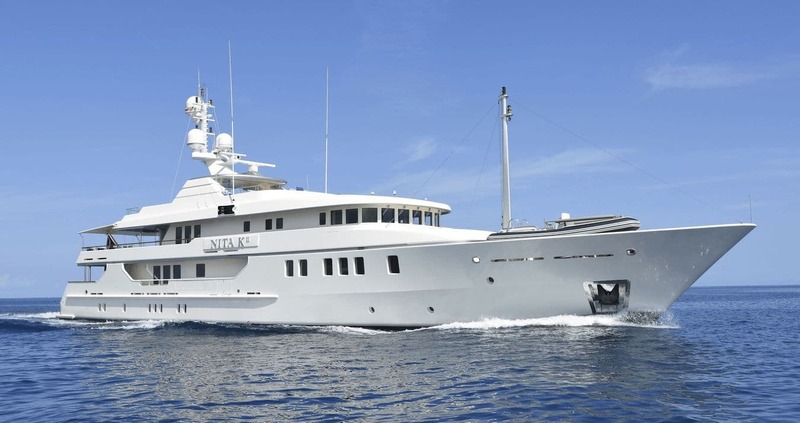 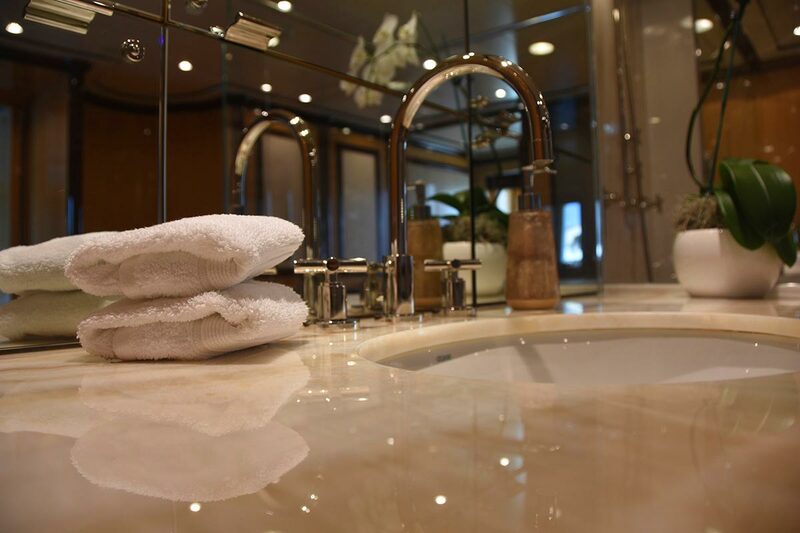 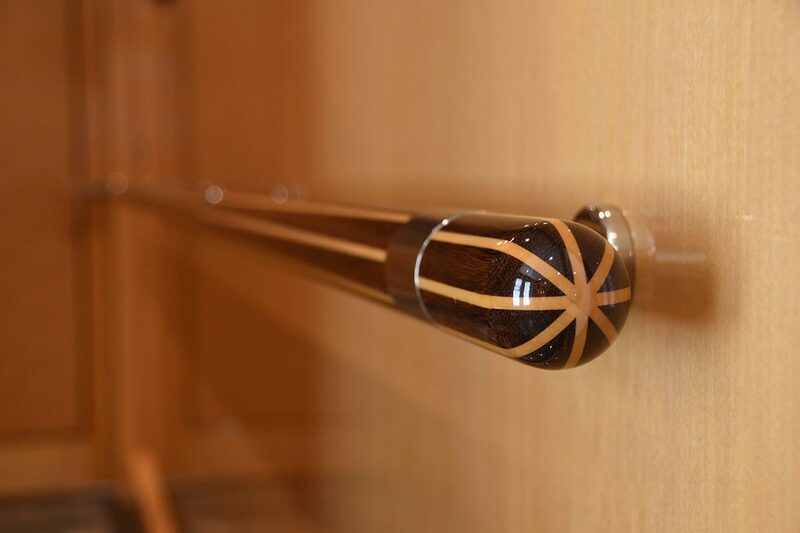 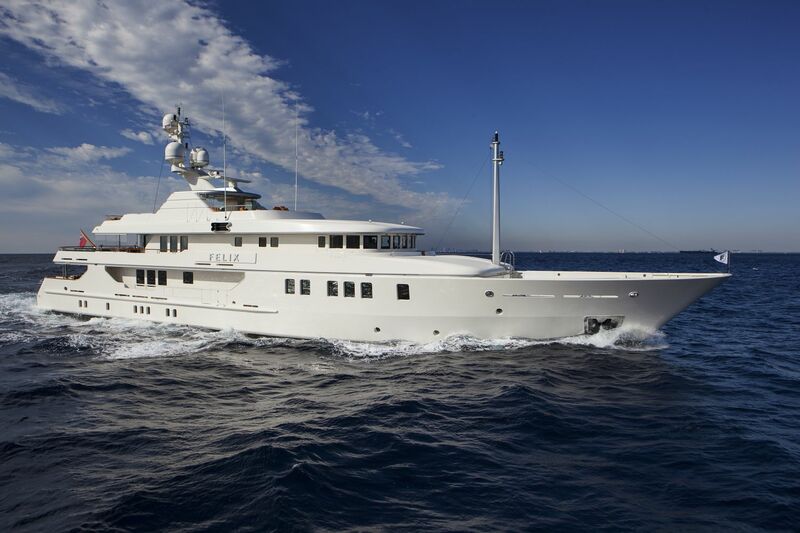 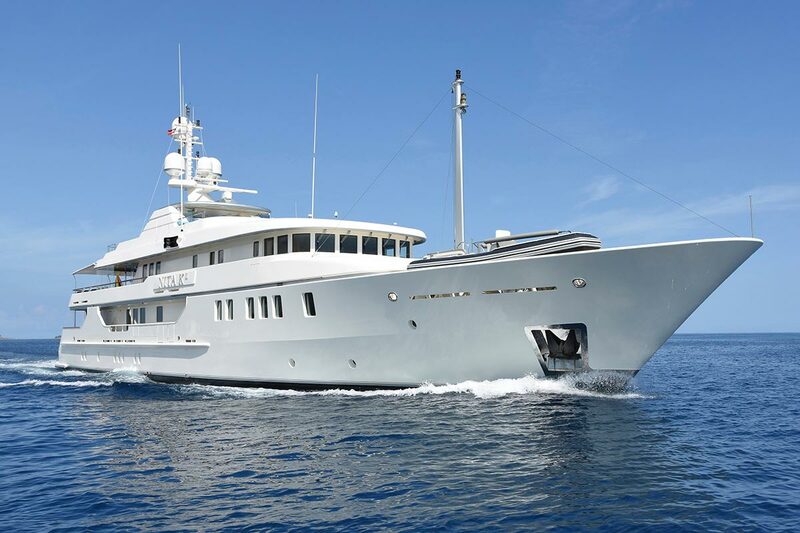 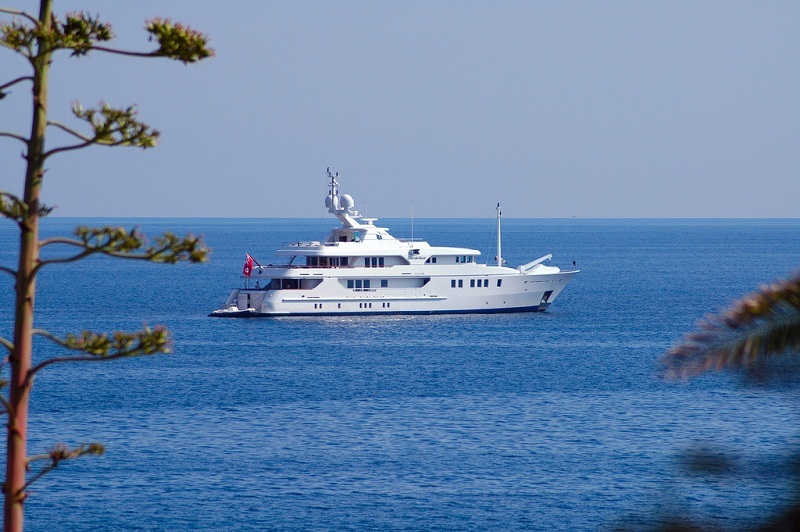 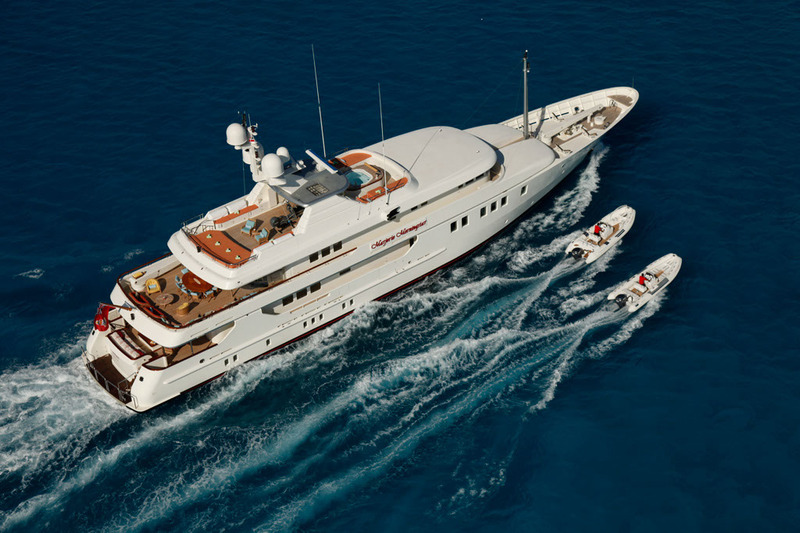 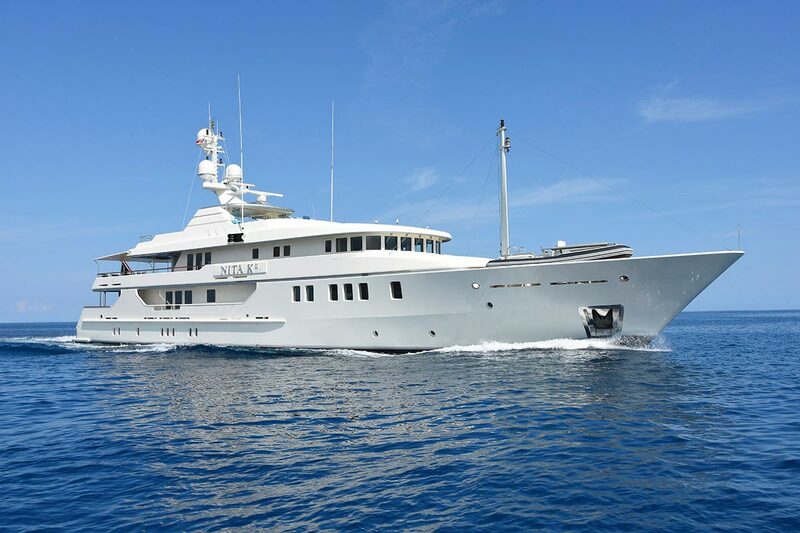 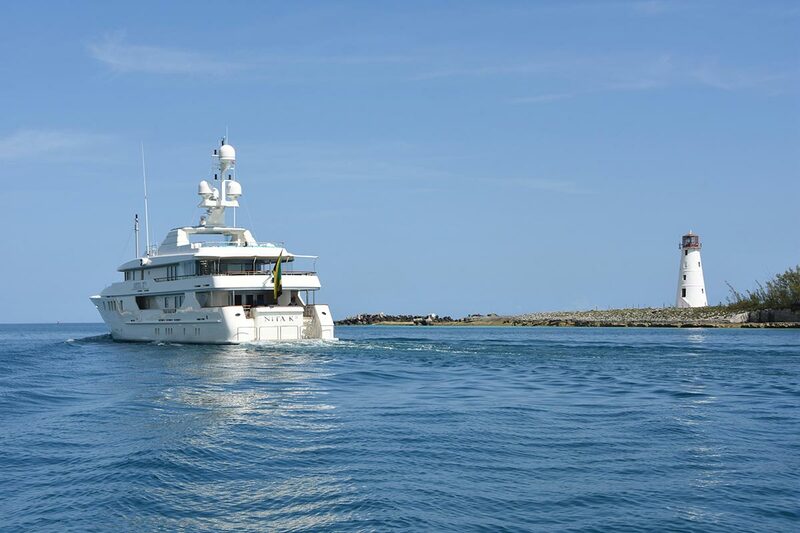 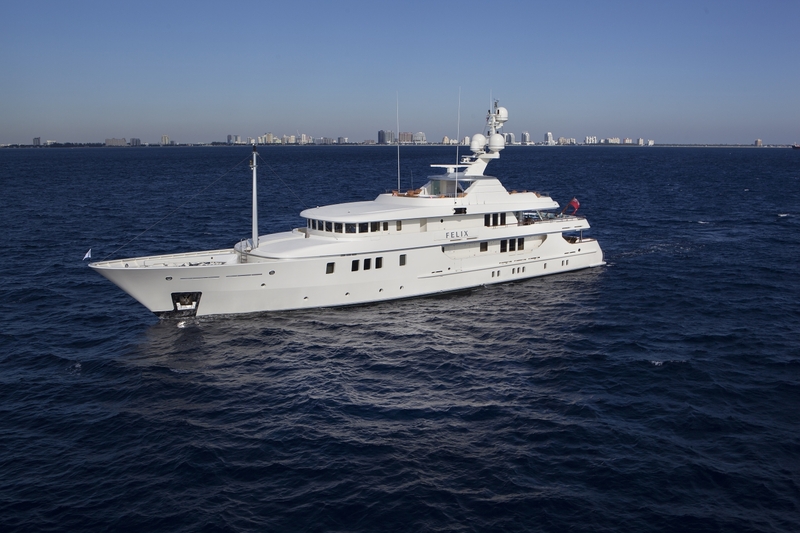 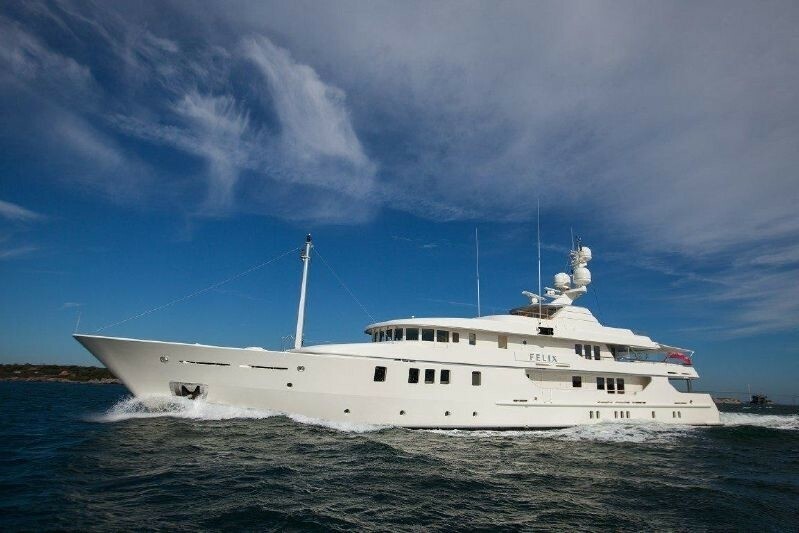 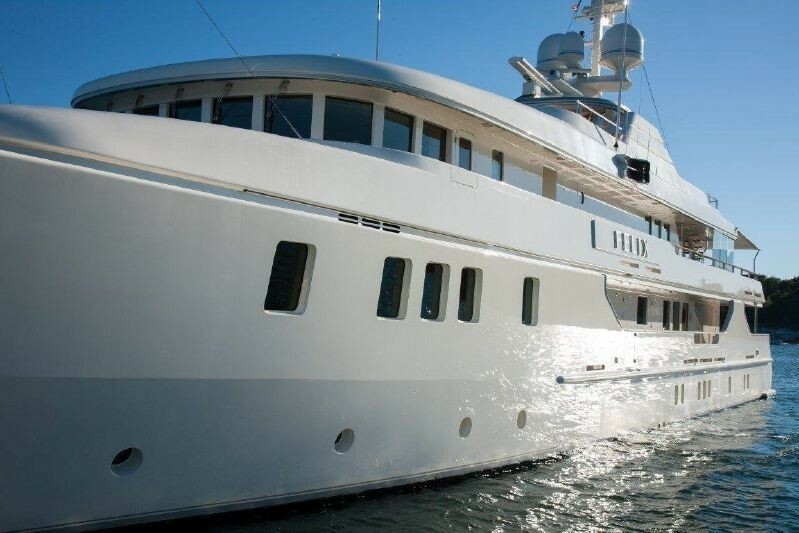 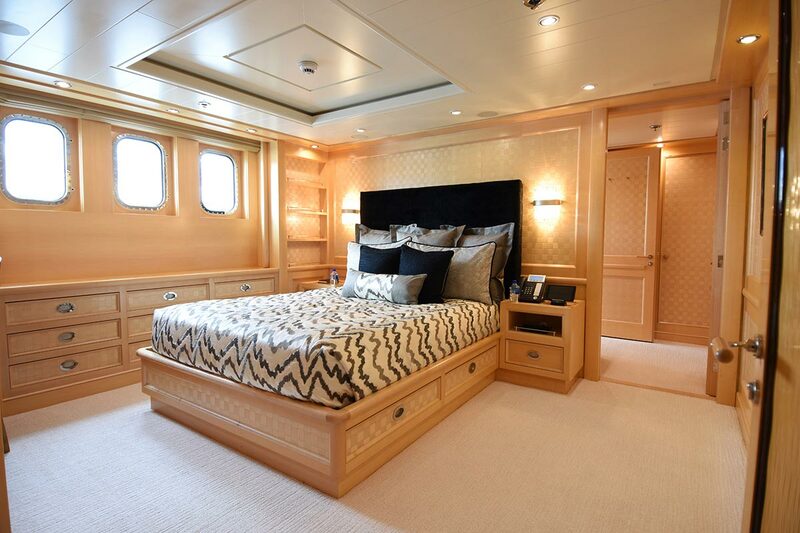 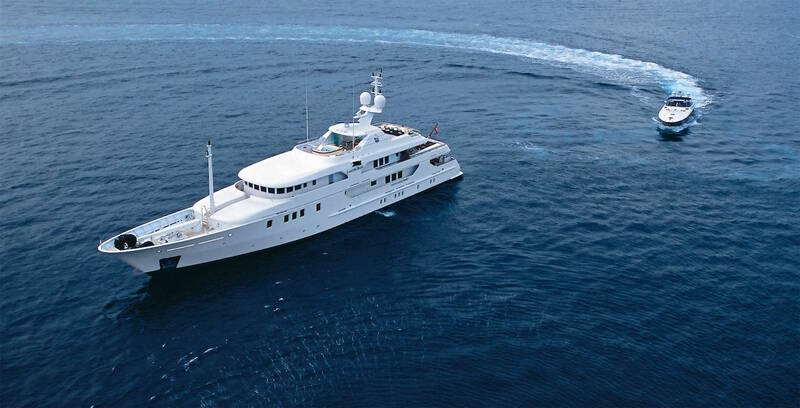 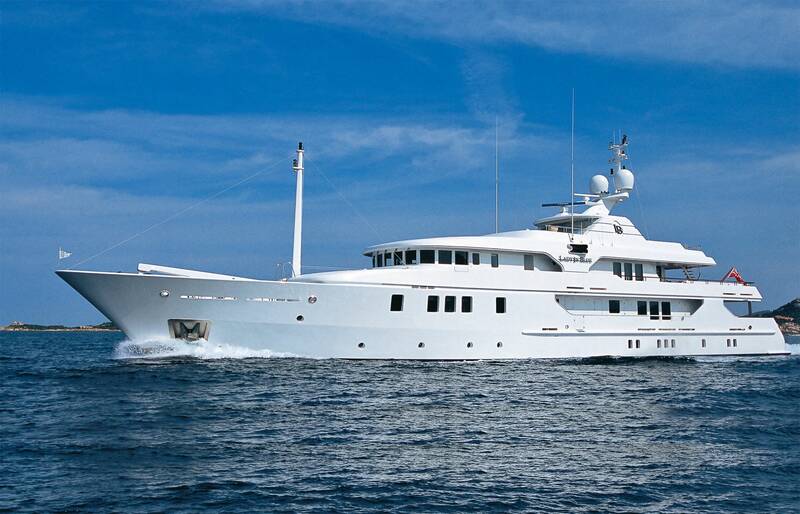 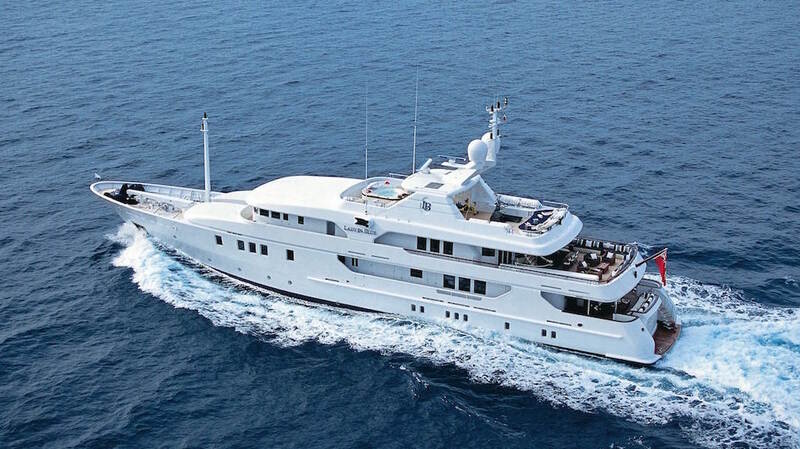 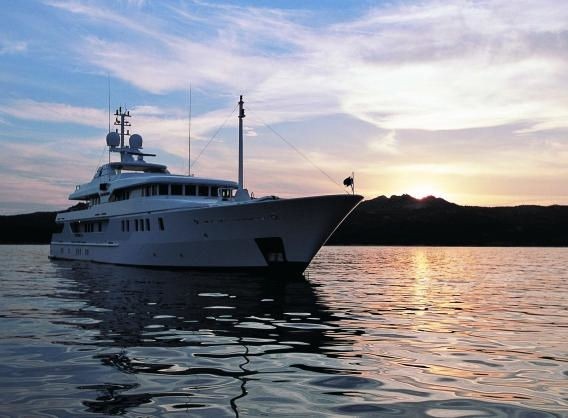 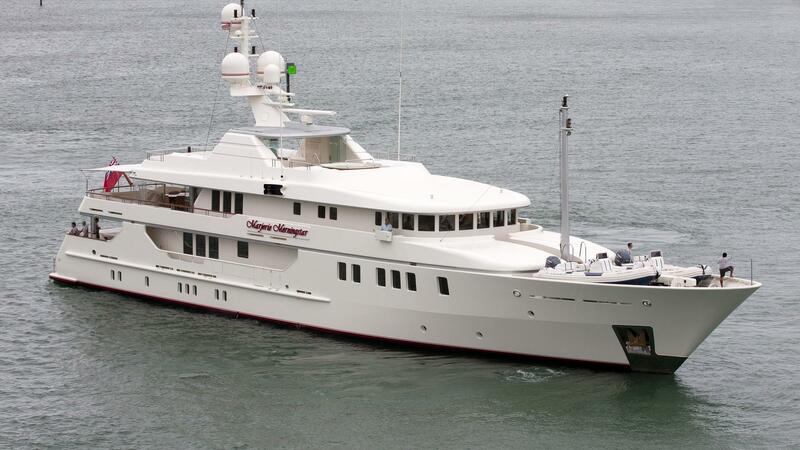 M/Y NITA K II also received a cosmetic refit in 2012 including a full paint and is looking better than ever. 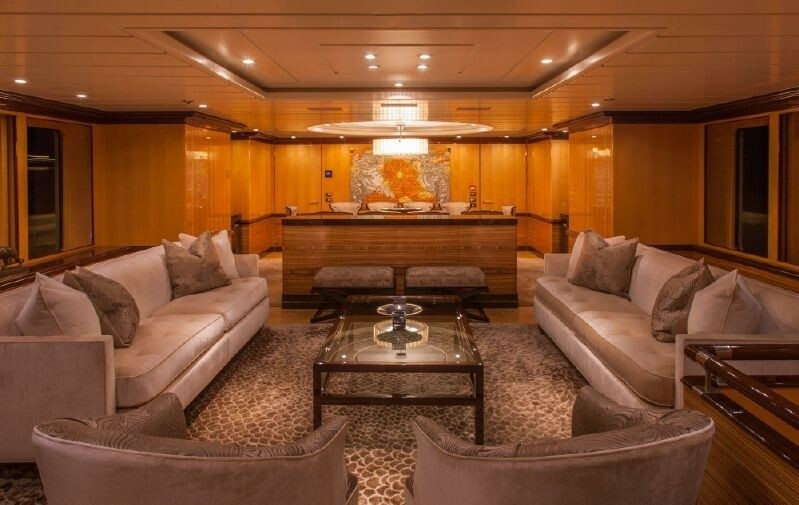 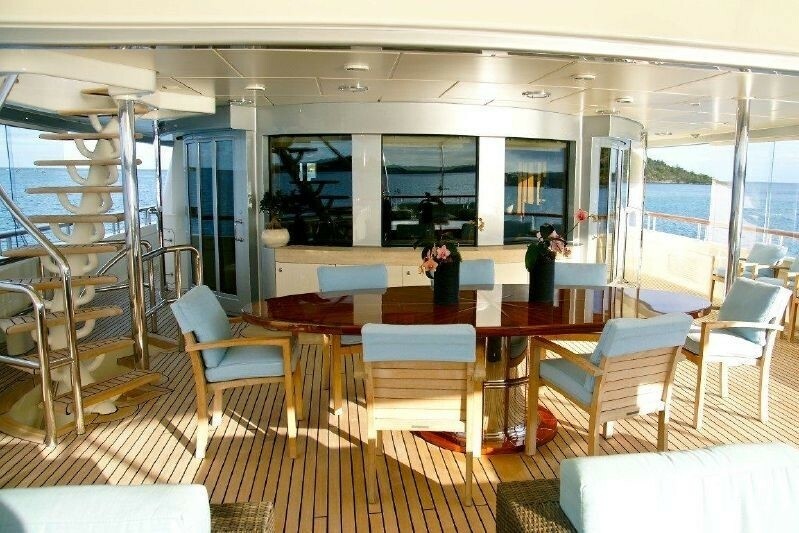 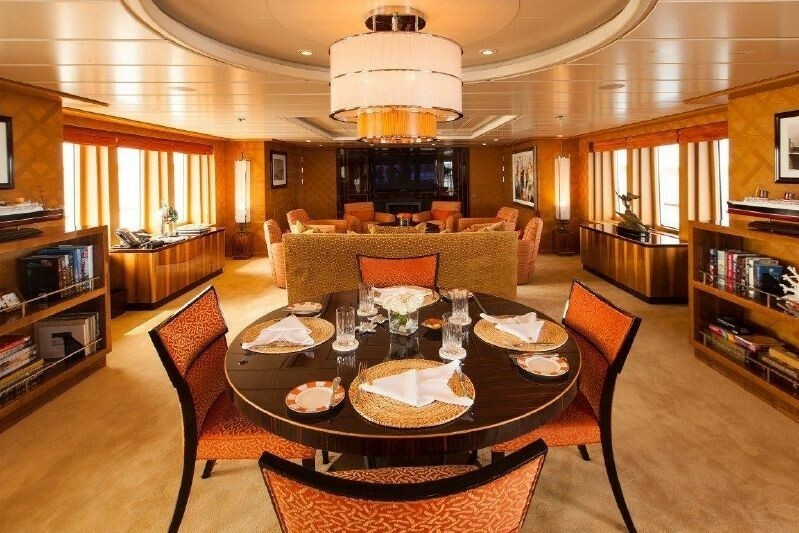 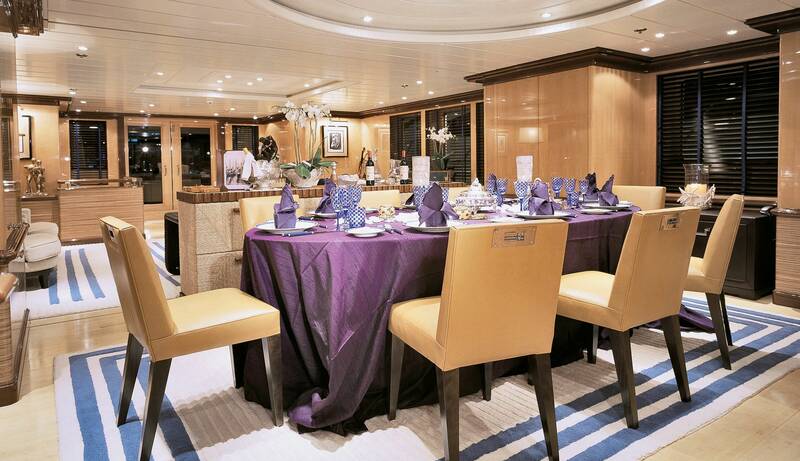 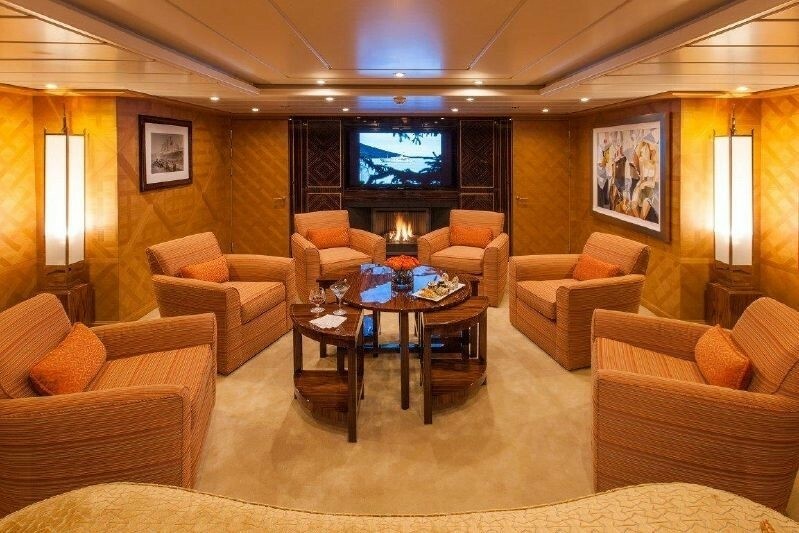 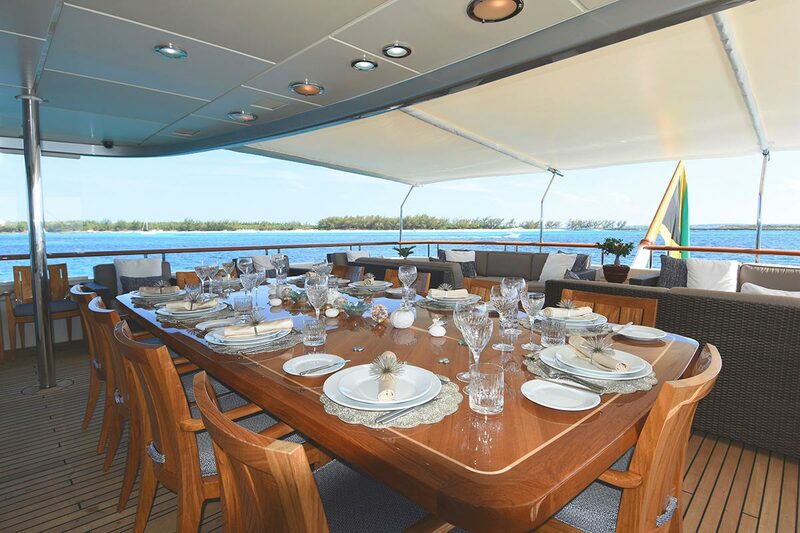 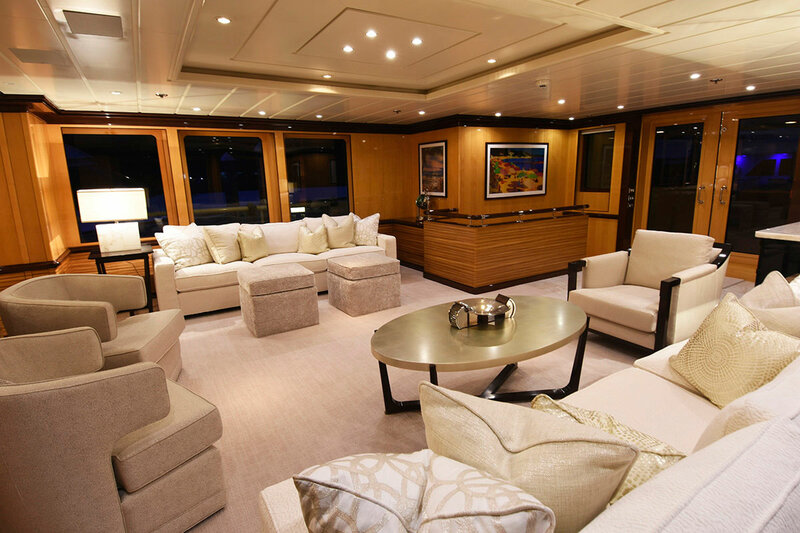 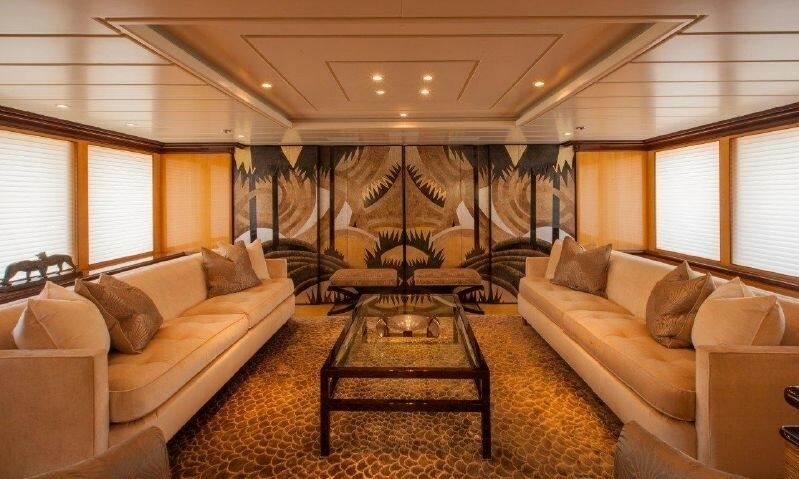 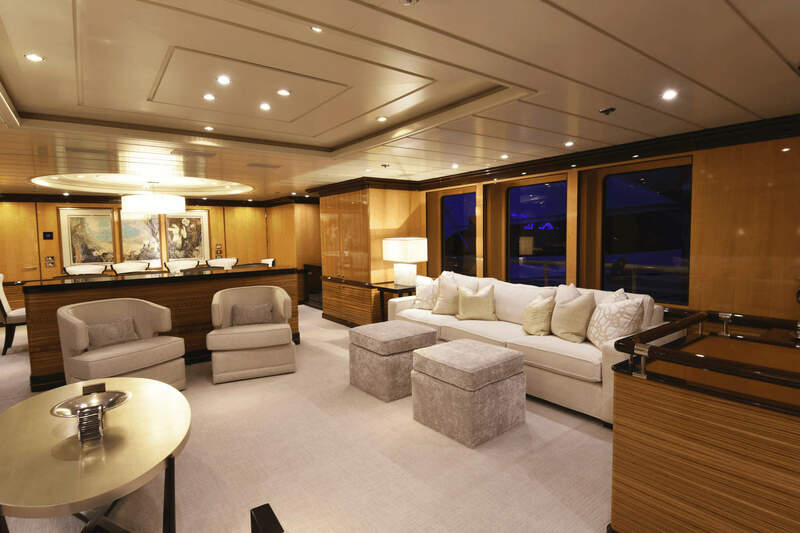 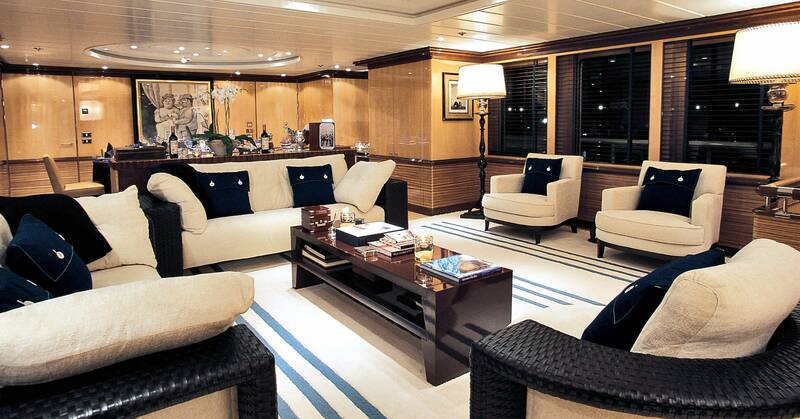 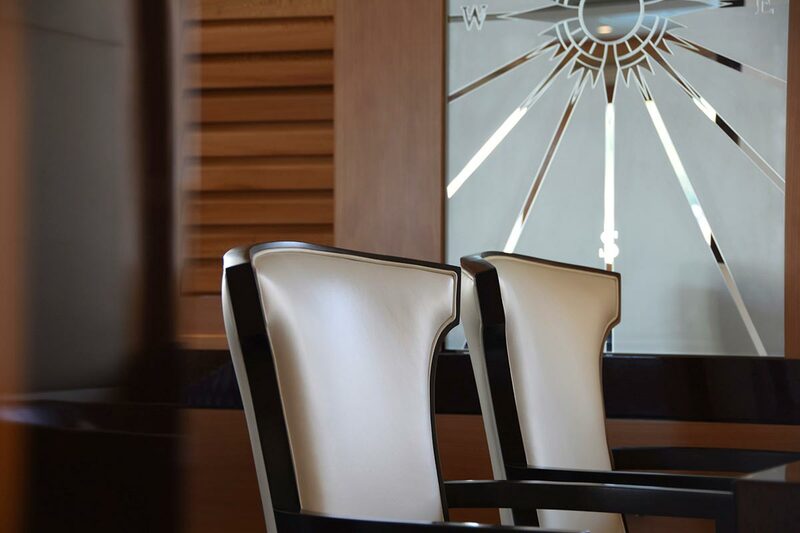 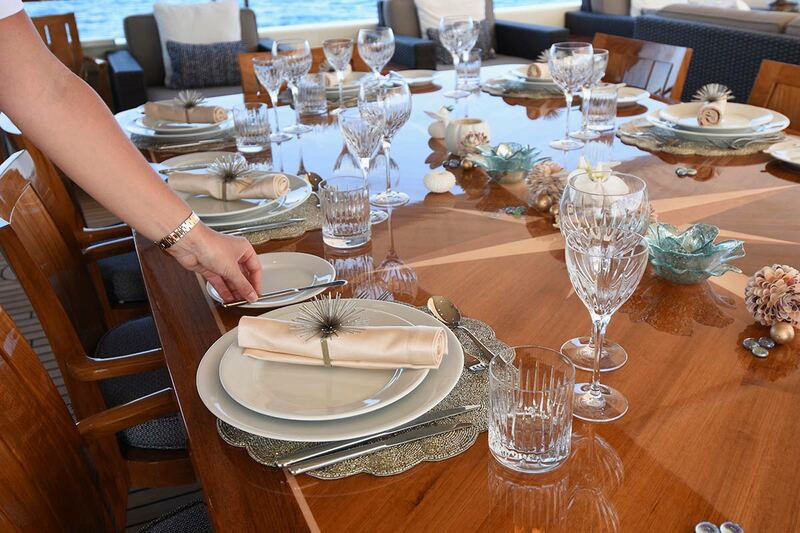 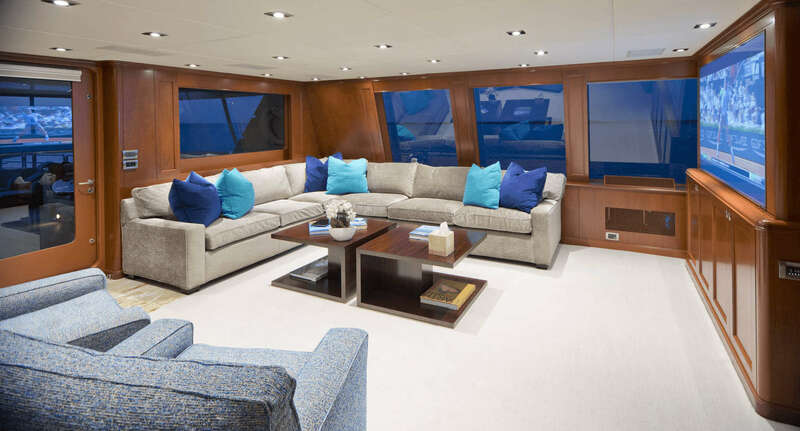 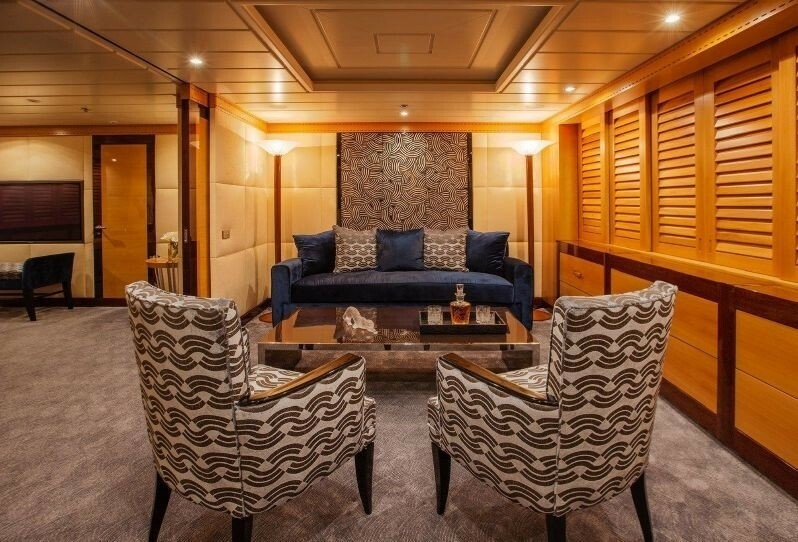 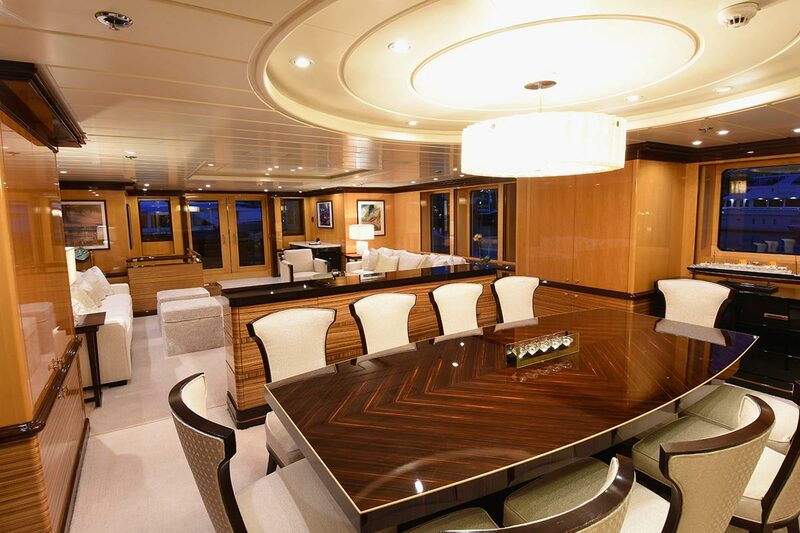 Superyacht NITA K II has a beautiful Main Salon with an adjacent formal dining area for 12 guests. 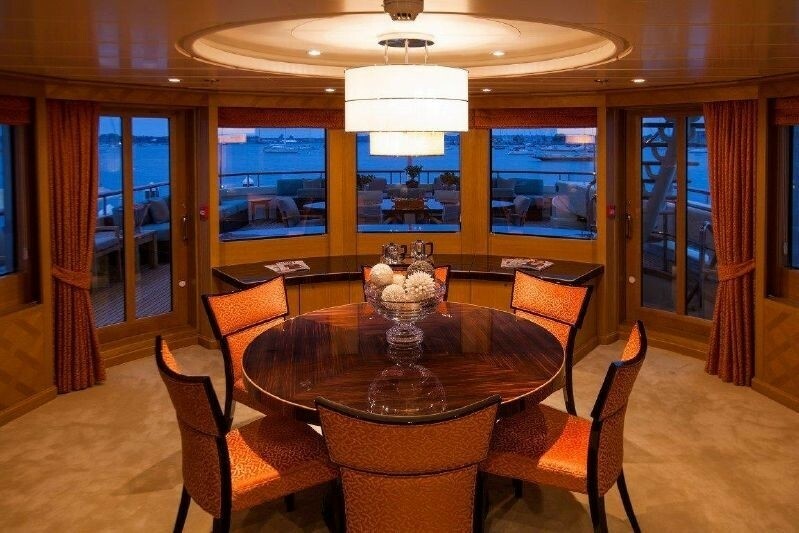 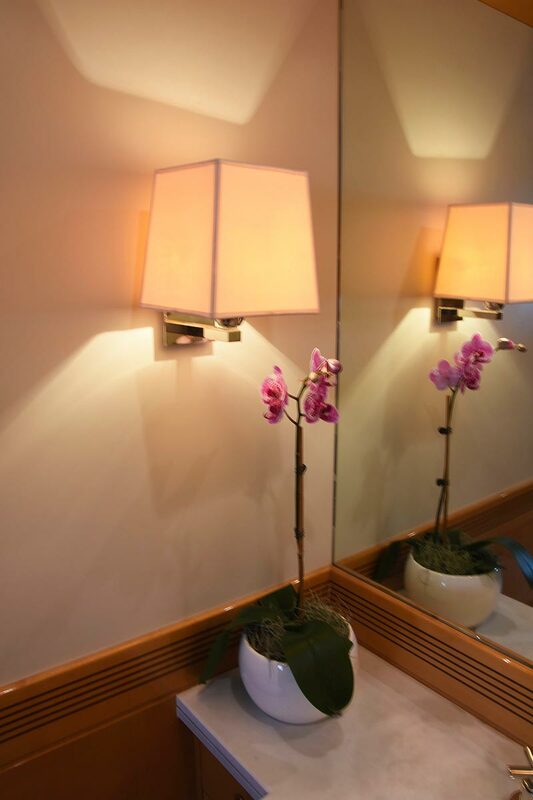 The Dining area can be closed off for privacy with movable decorative panels. 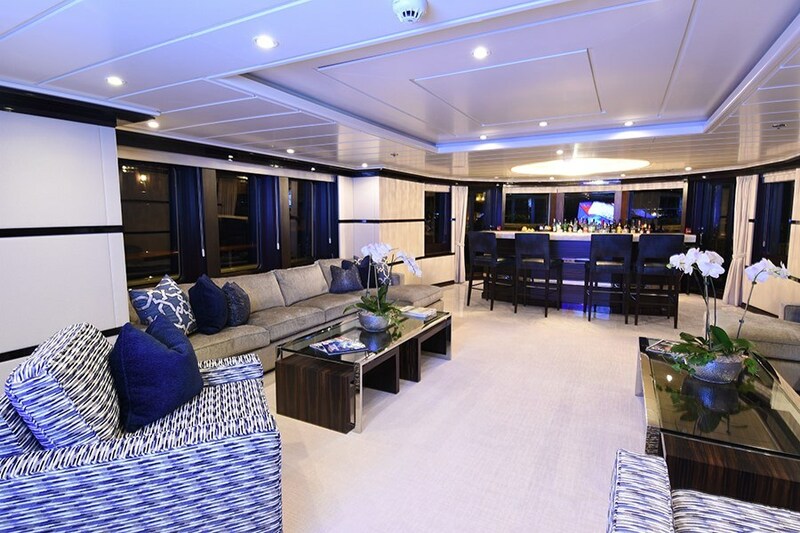 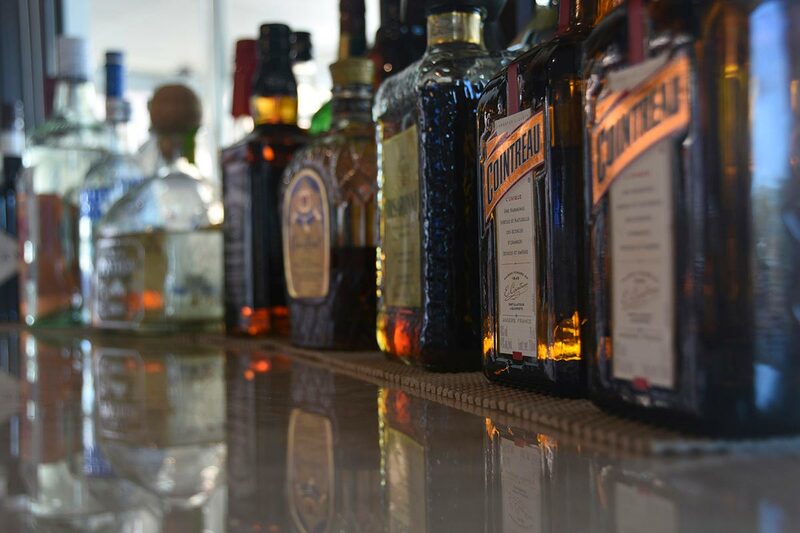 On the upper deck, the Sky lounge features a full entertainment center with 50” Plasma TV/DVD/CD, console DJ, Karaoke, Working fire place and a casual dining area aft for 6. 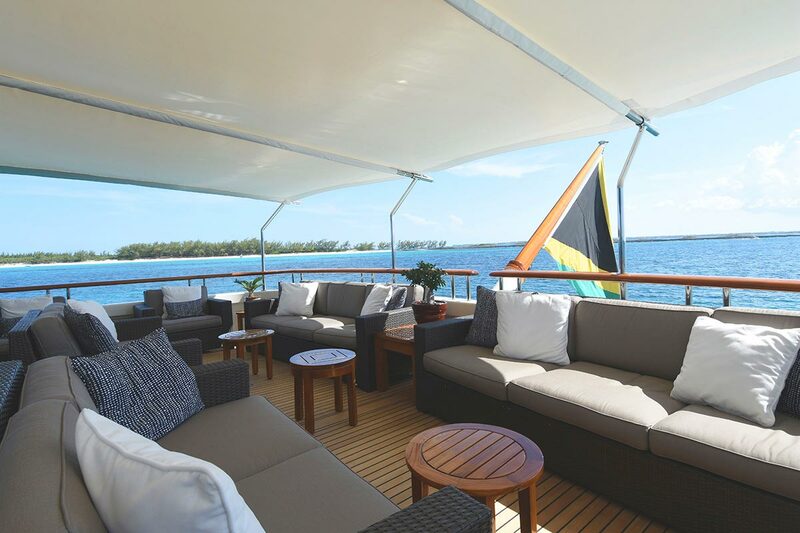 The NITA K II 's external deck areas are grand and include a large shaded aft with comfortable seating and access to swim platform and Bridge deck. 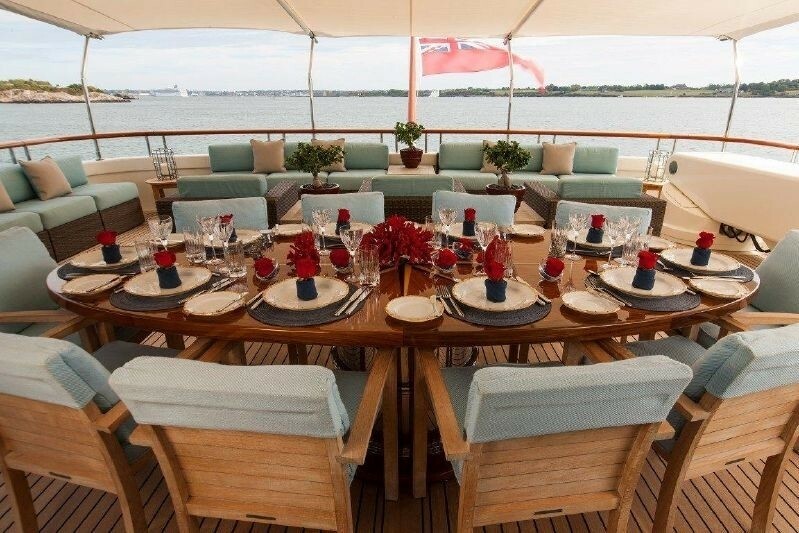 There is casual alfresco dining for 12 guests, aft couches with table and four cushioned chairs, seating for 12. 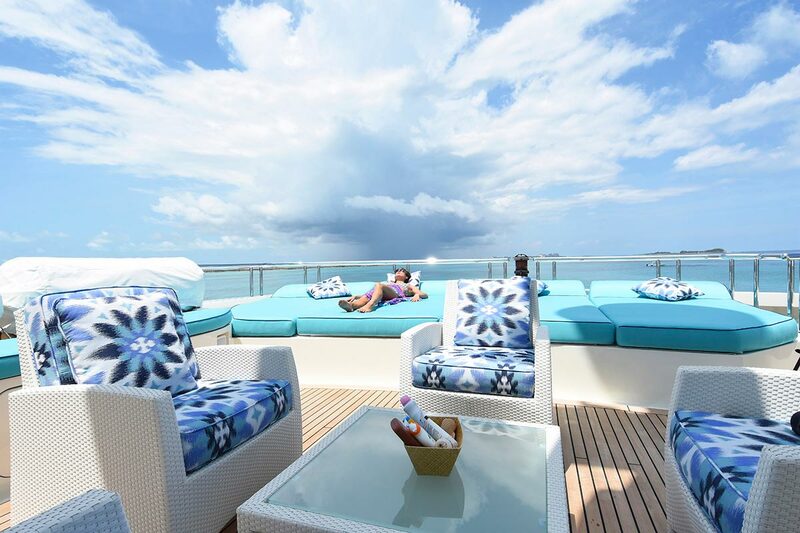 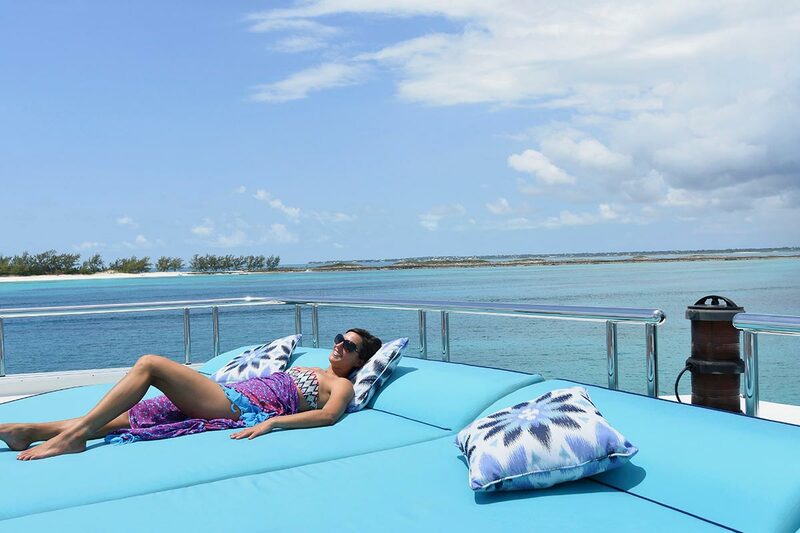 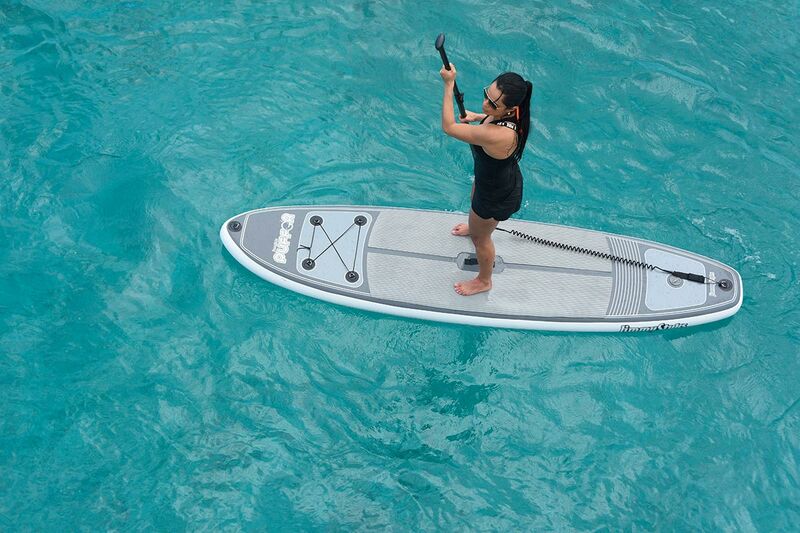 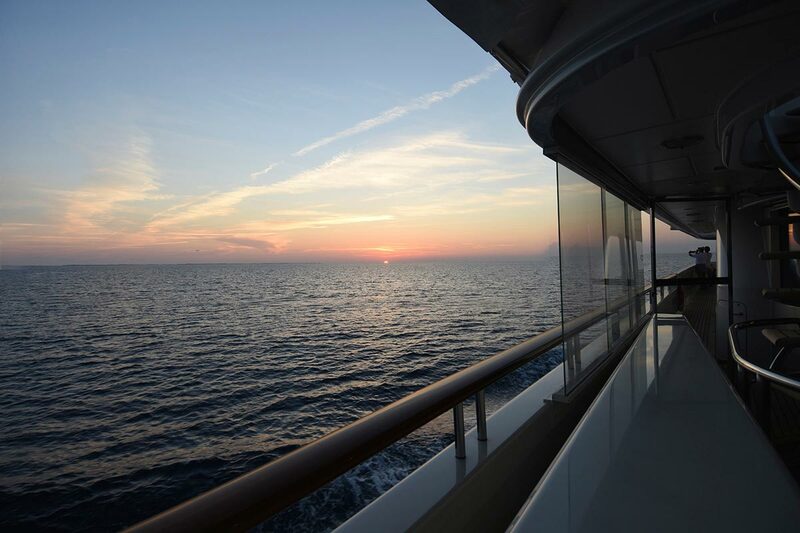 The Sundeck boasts a Spa Pool, sun pads, bar, elliptical machines, weight bench and convertible sun beds. 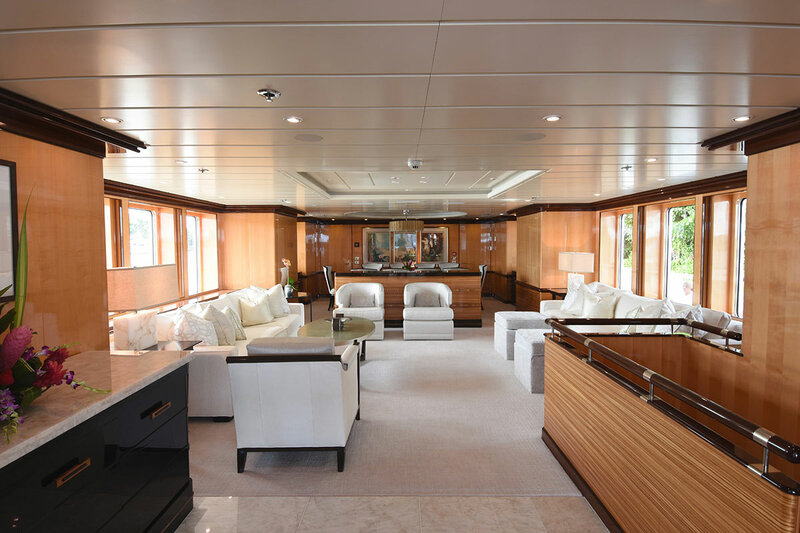 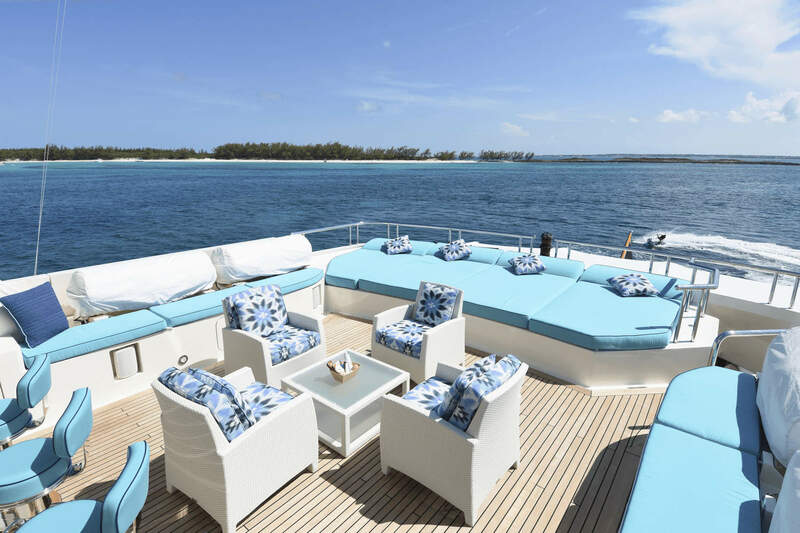 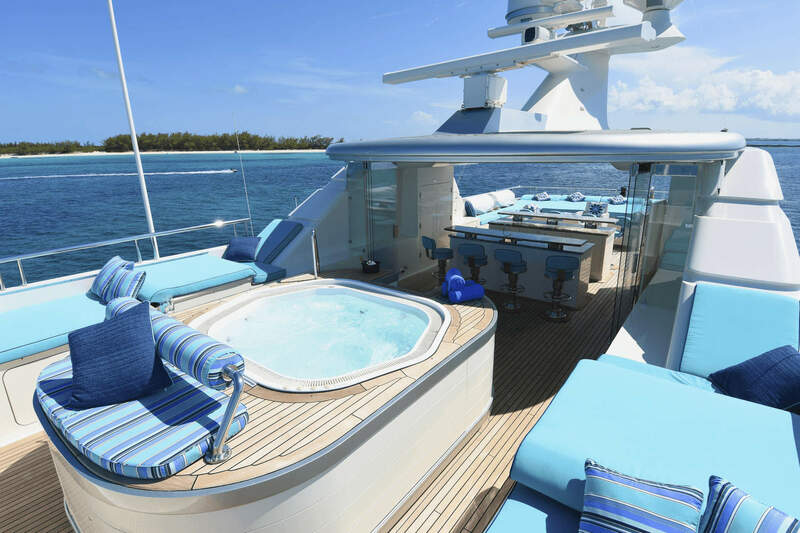 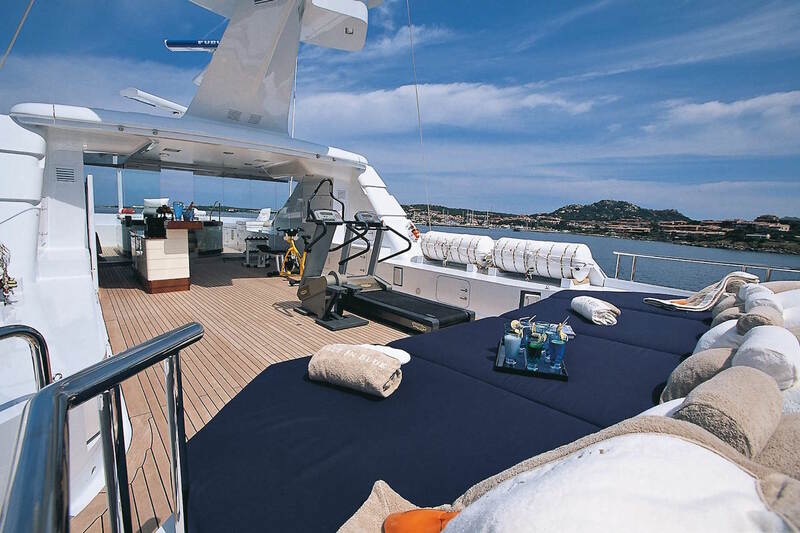 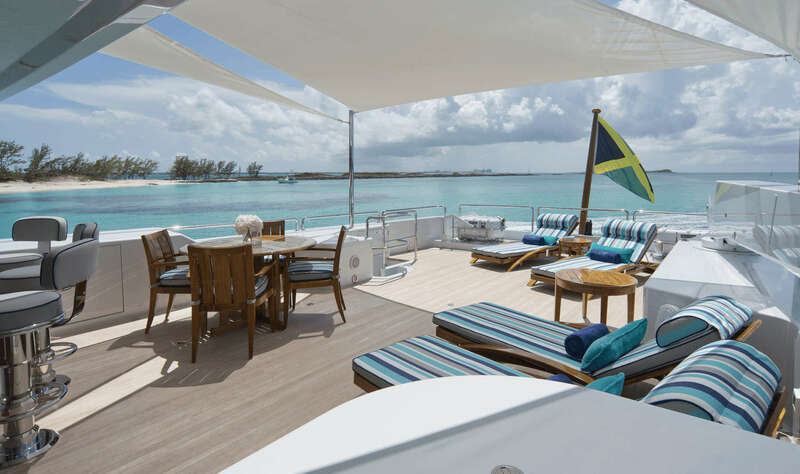 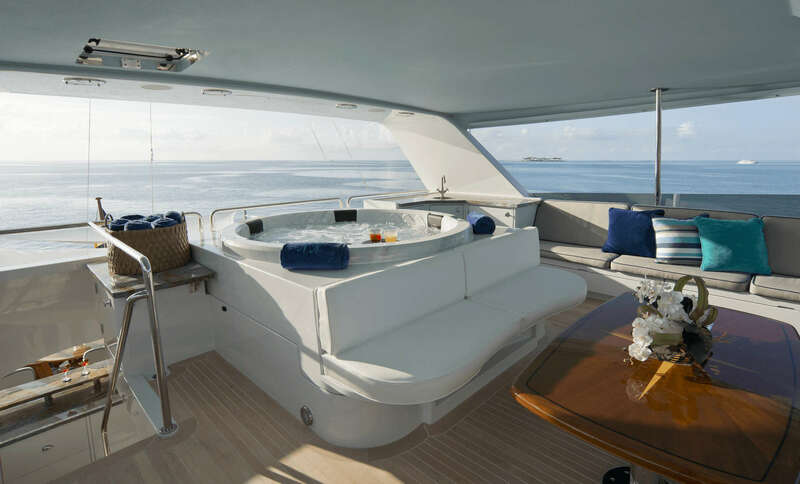 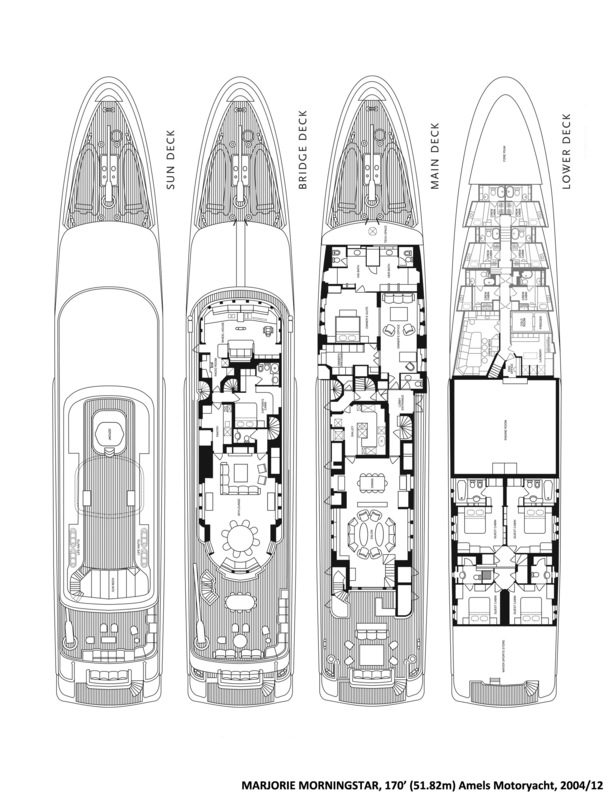 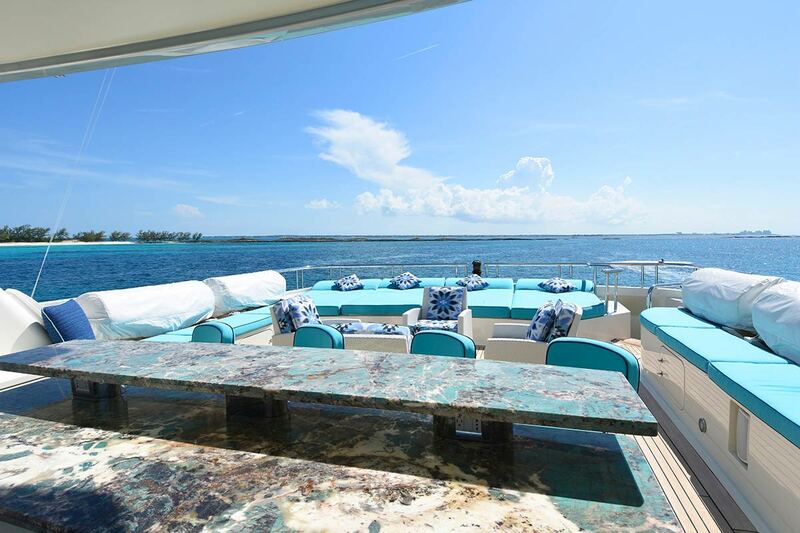 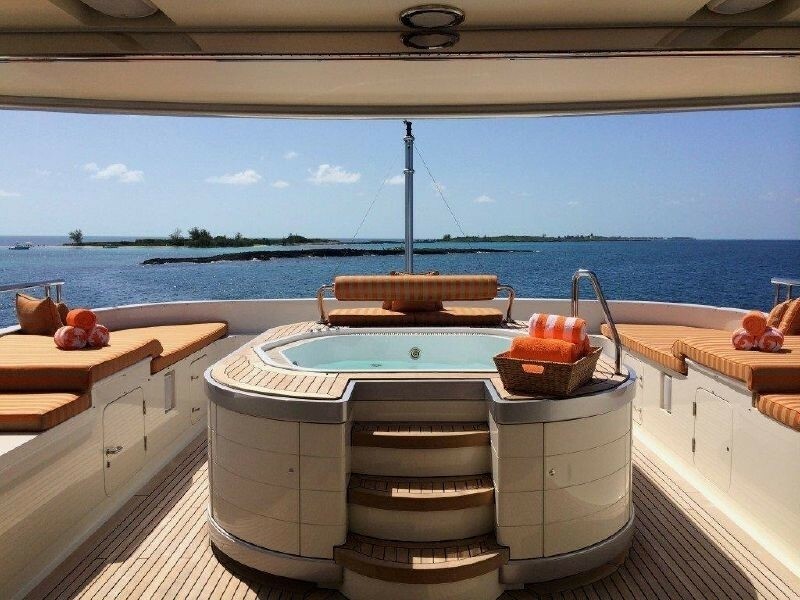 Also the yacht’s has well-planned deck space, and the main sundeck and aft bridge deck lounge have been specially designed to accommodate larger numbers of guests. 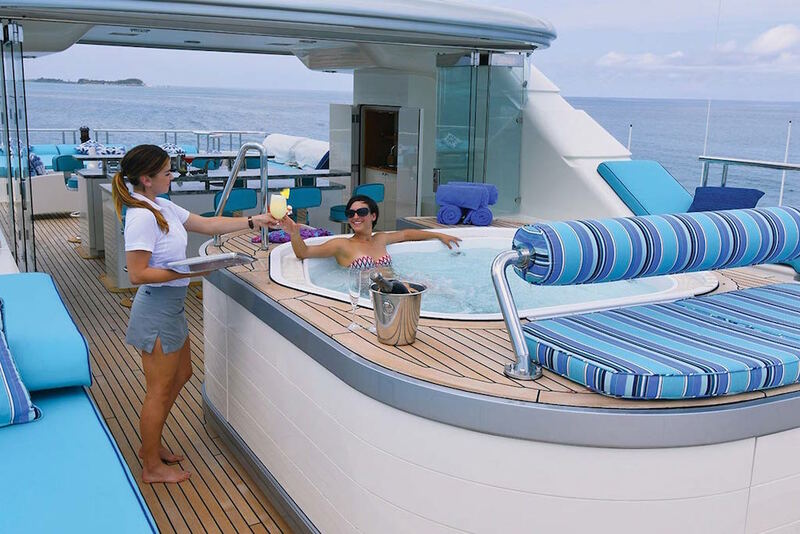 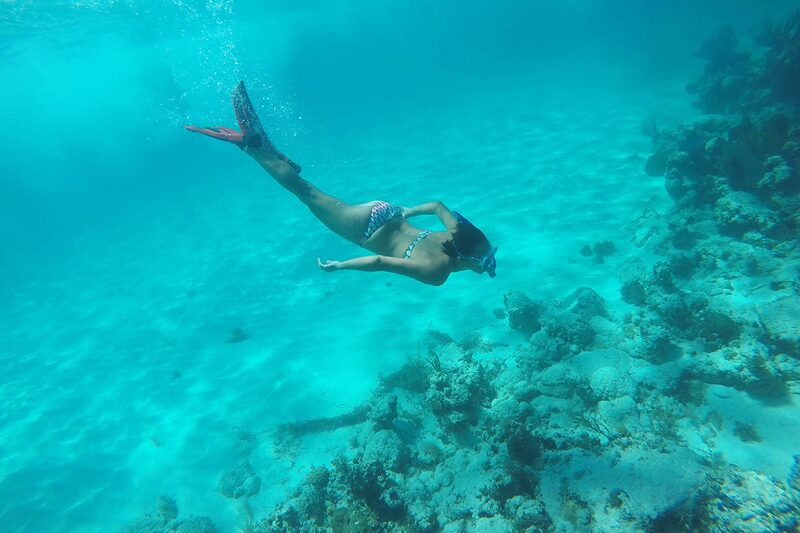 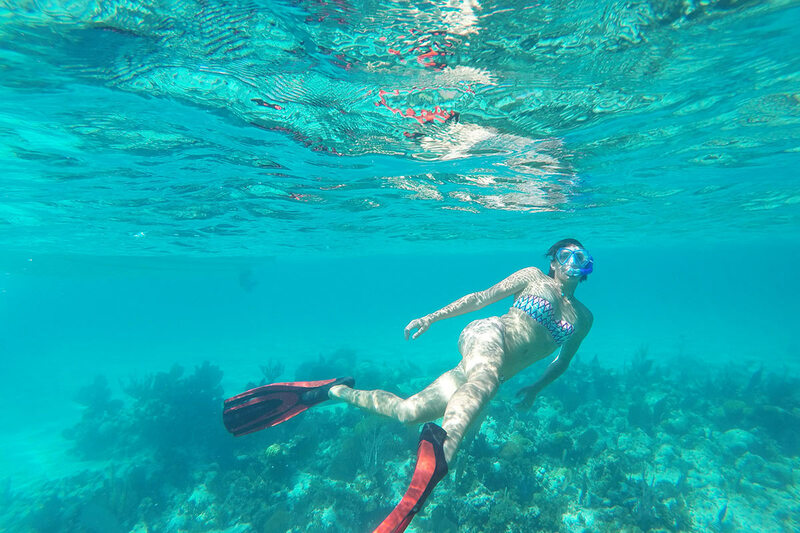 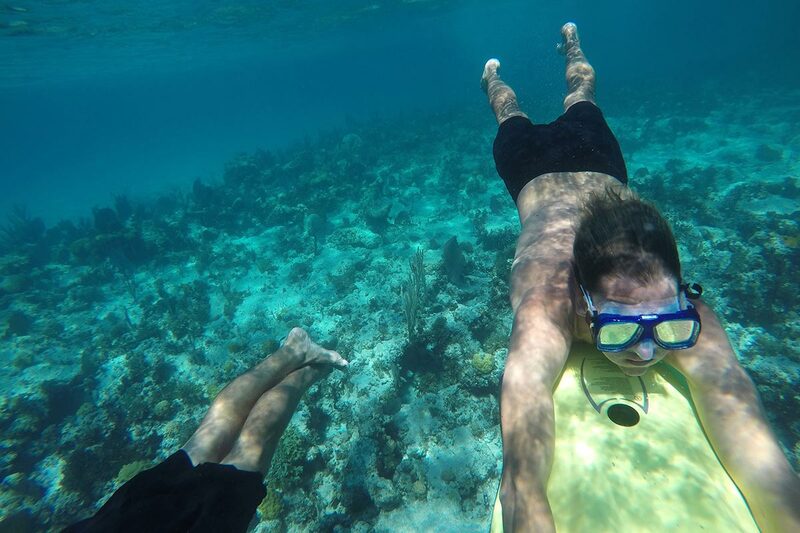 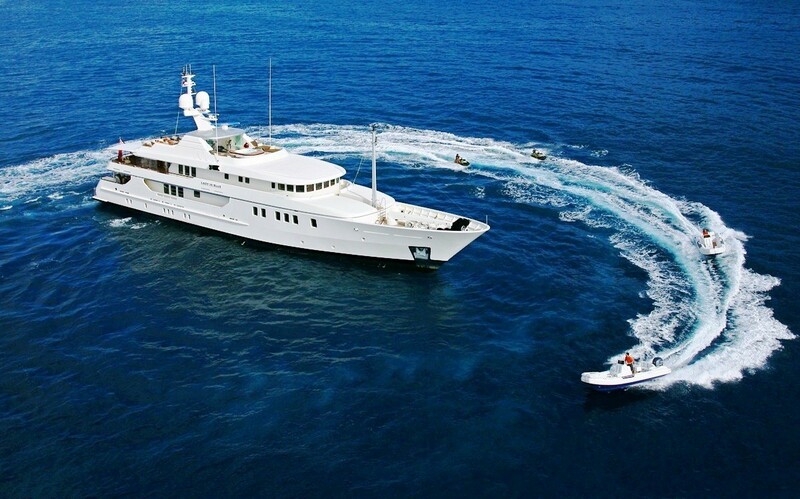 She makes a brilliant charter yacht offering guests everything they could imagine on a superior luxury yacht charter vacation. 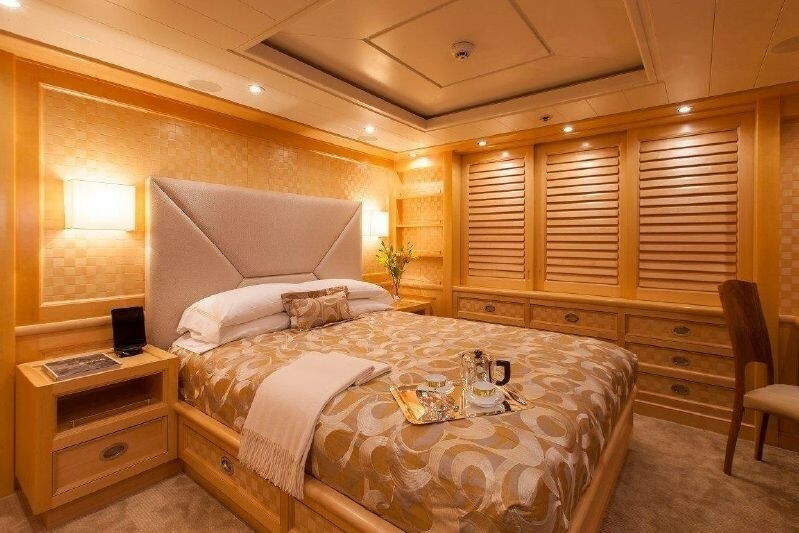 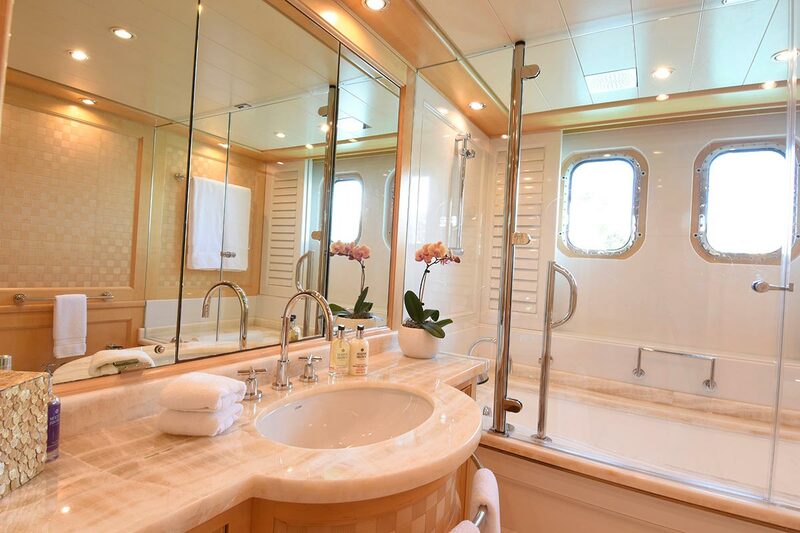 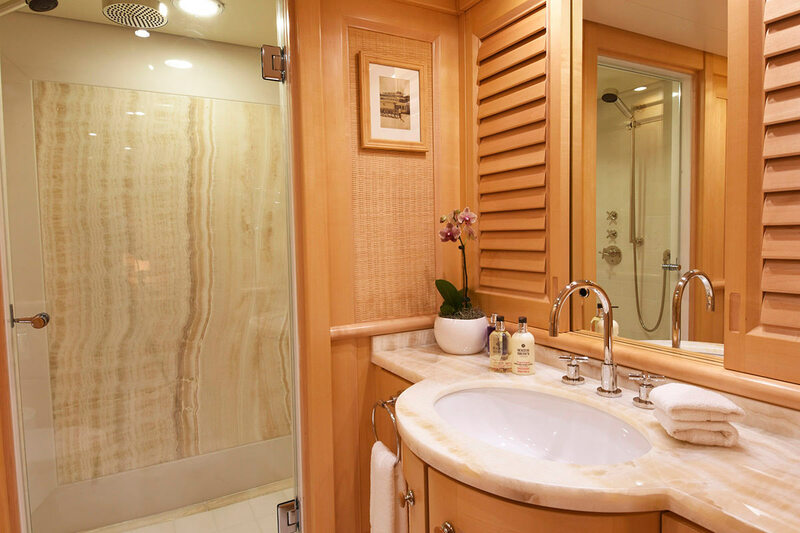 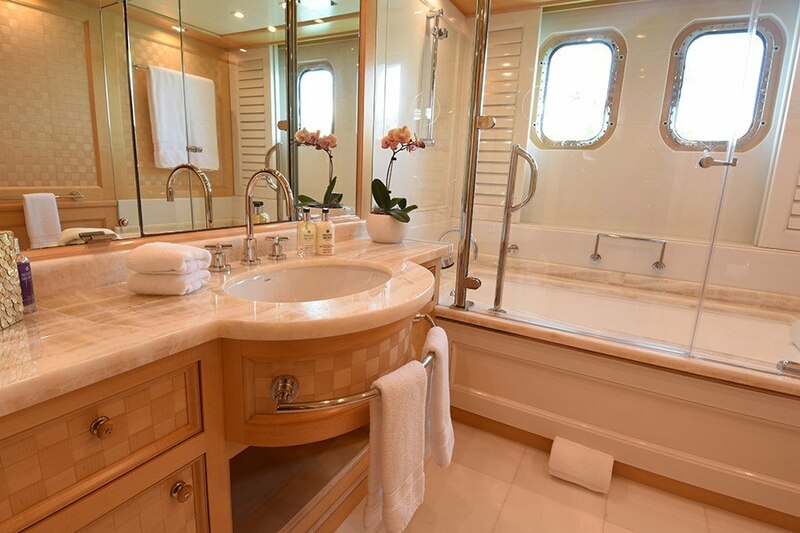 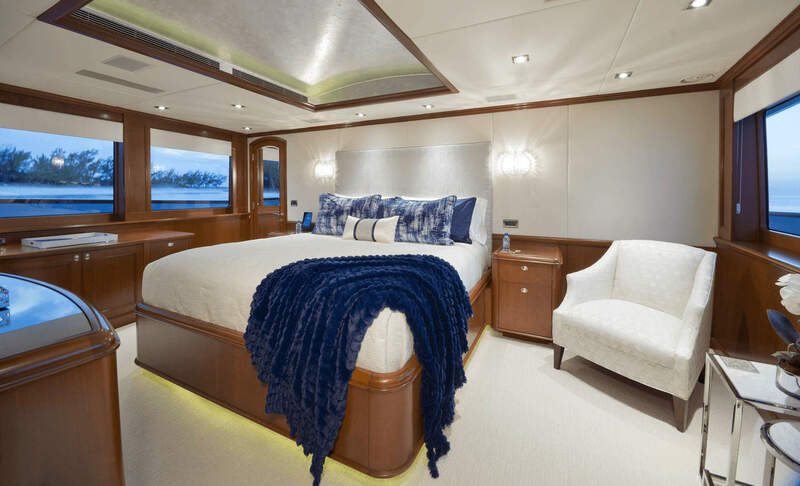 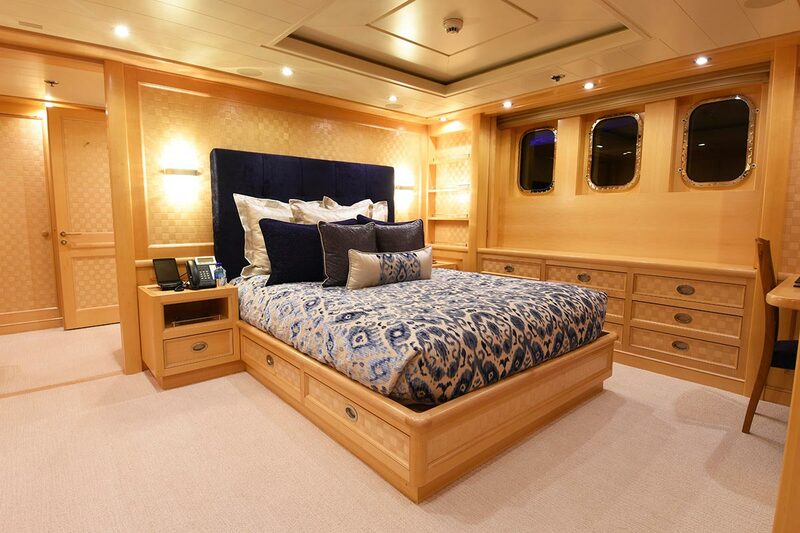 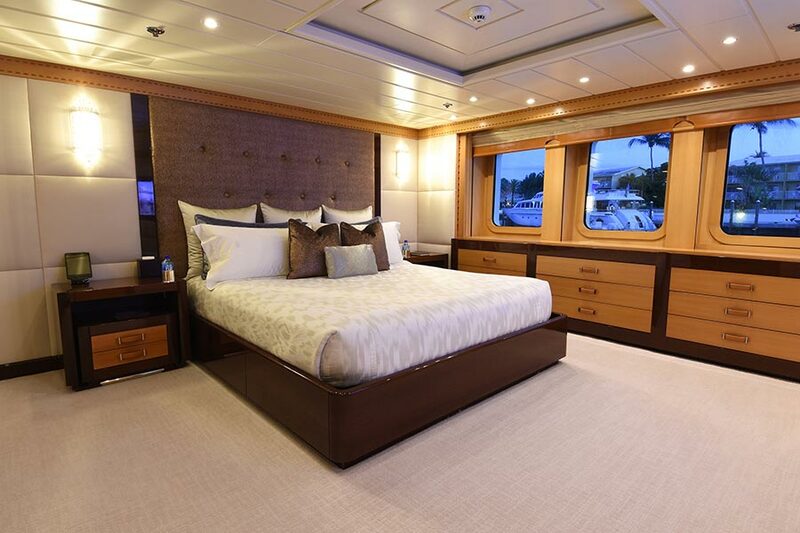 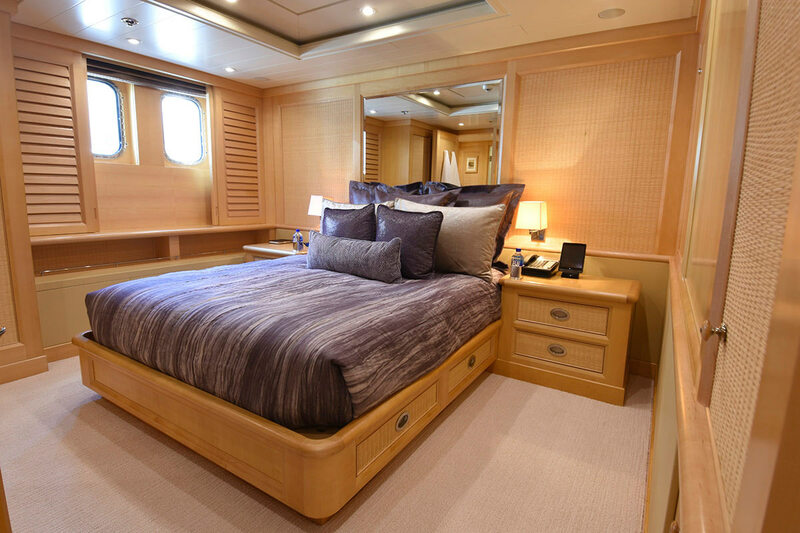 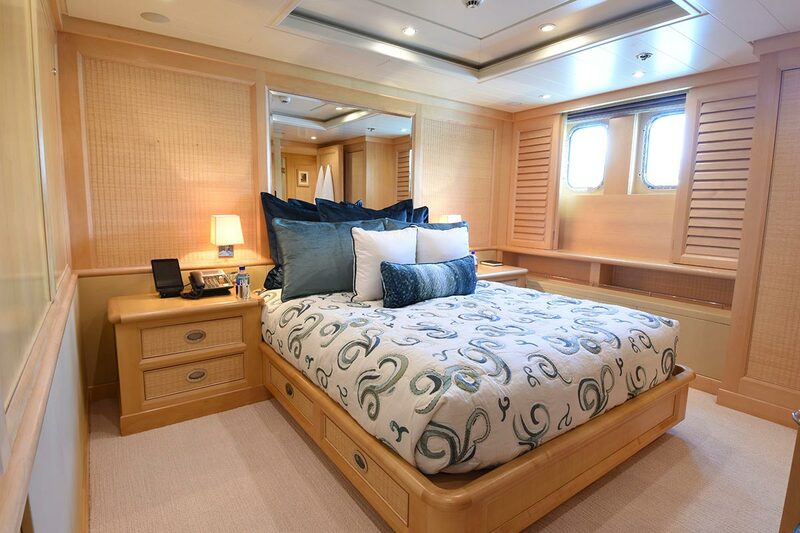 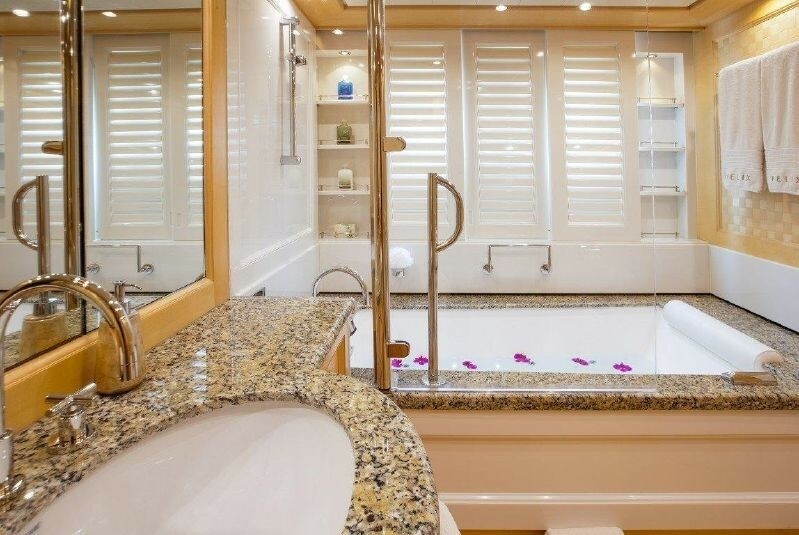 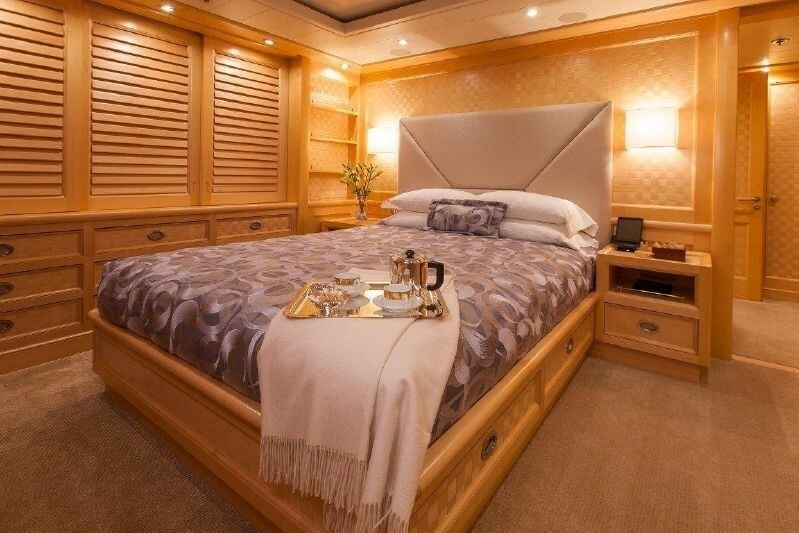 Luxury Amels yacht NITTA K II offers superior accommodation for up to 12 guests in 5 staterooms in the following layout: The luxury yacht's Master Stateroom is situated forward and on deck and provides a King sized bed with a His & Hers ensuite bathroom and a separate private study. 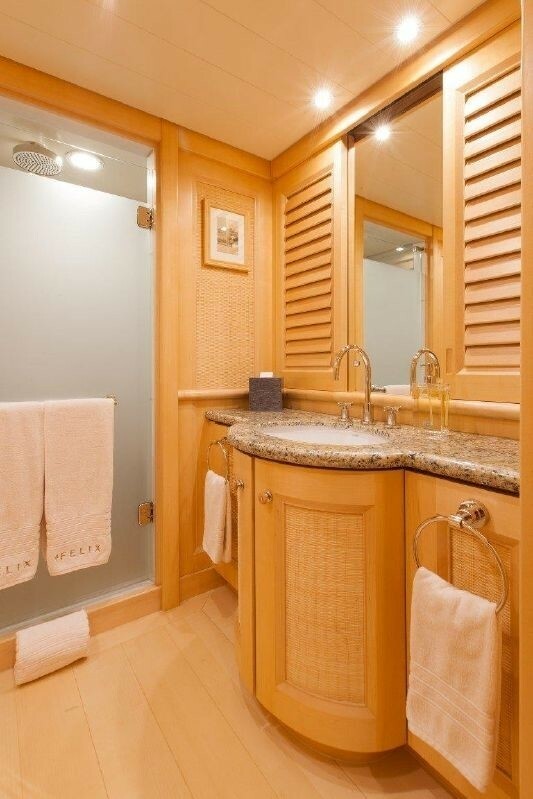 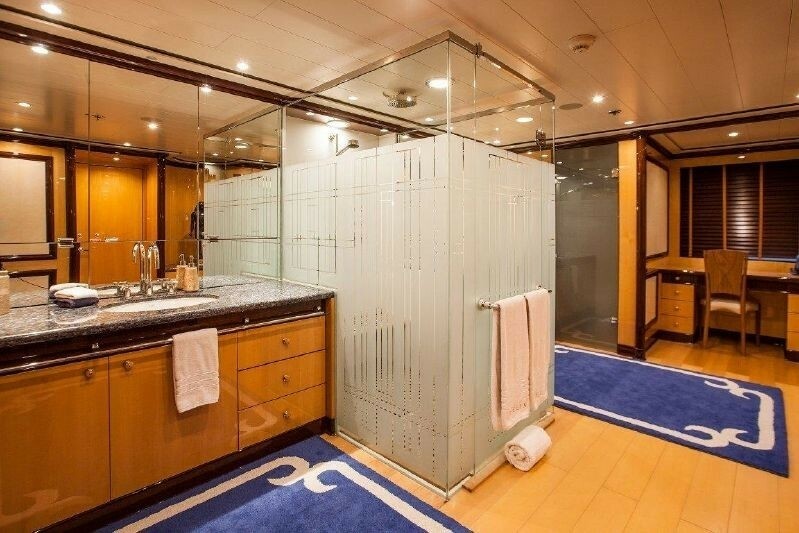 The full ensuite boasts an enlarged shower. 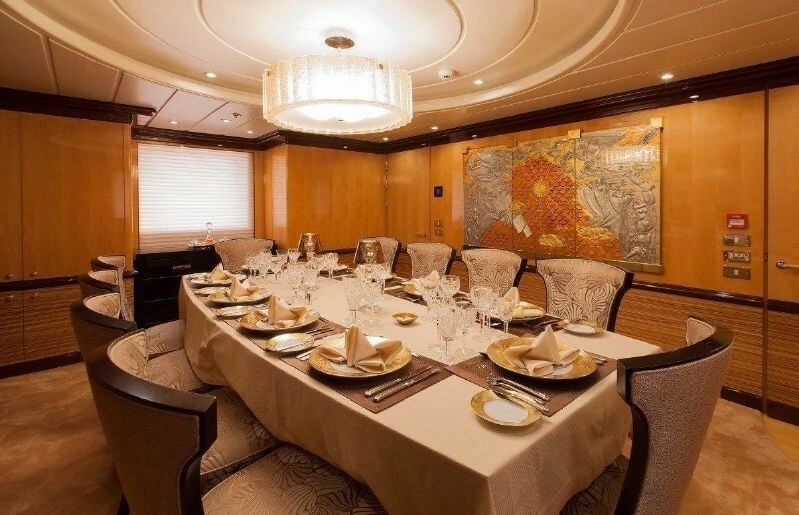 There is also a 50 inch Plasma screen with TV & DVD & CD in the room. 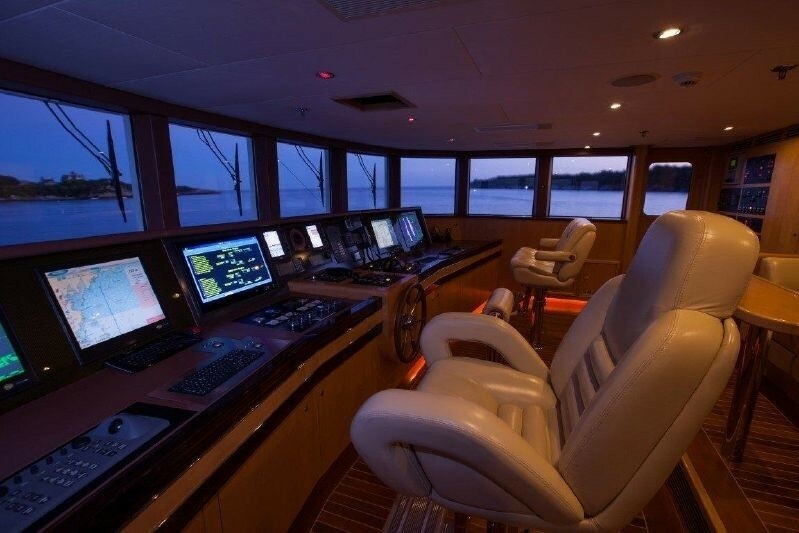 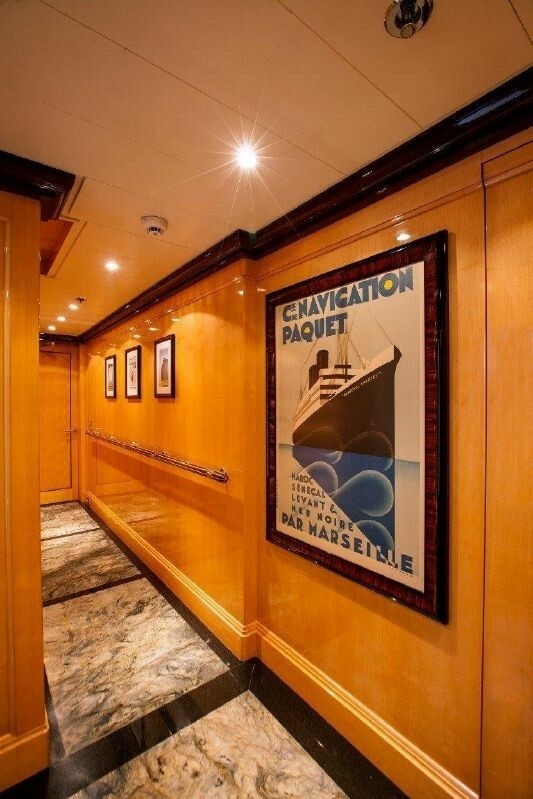 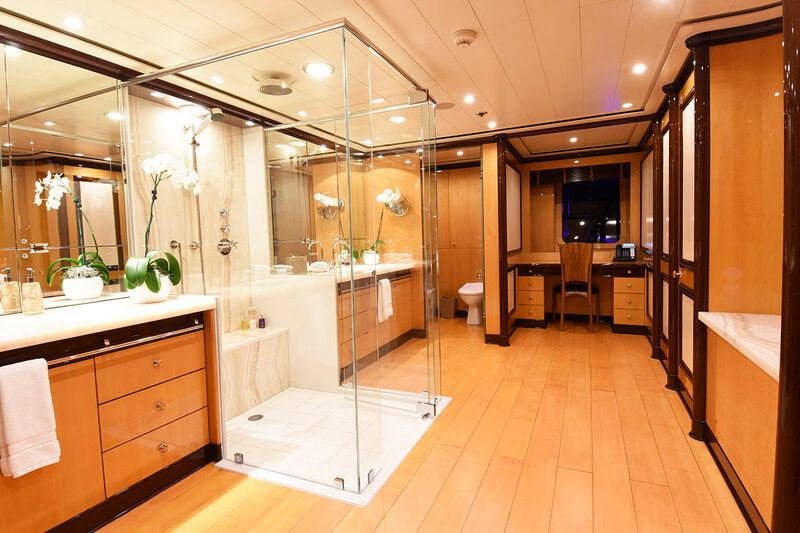 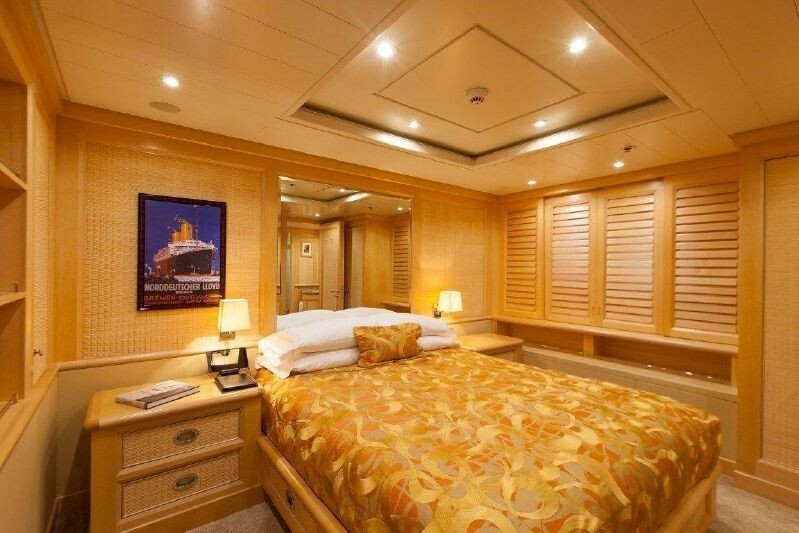 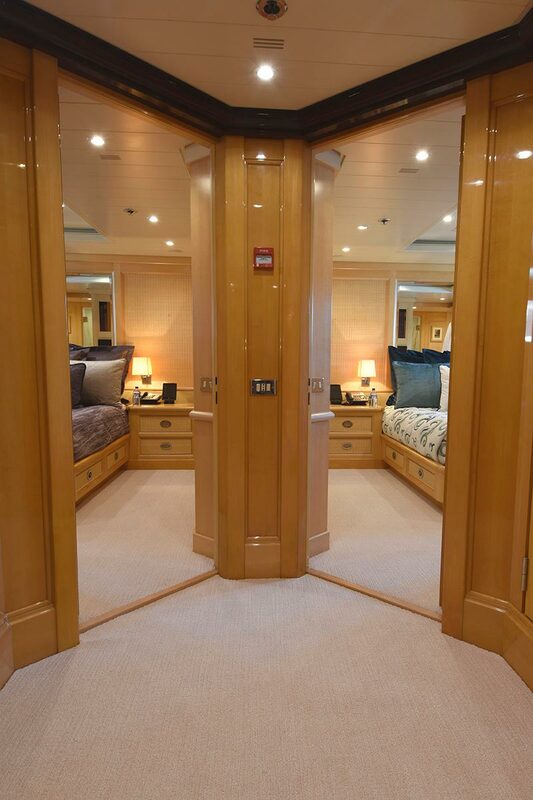 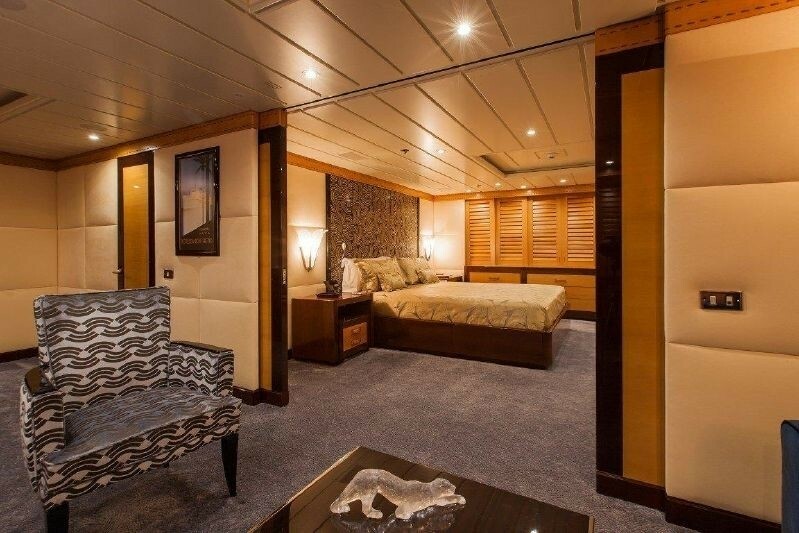 There are two guests cabins located below deck to port with a Queen sized bed, an ensuite bathroom with tub & shower and a 36 inch Plasma screen with TV & DVD & CD & Stereo. 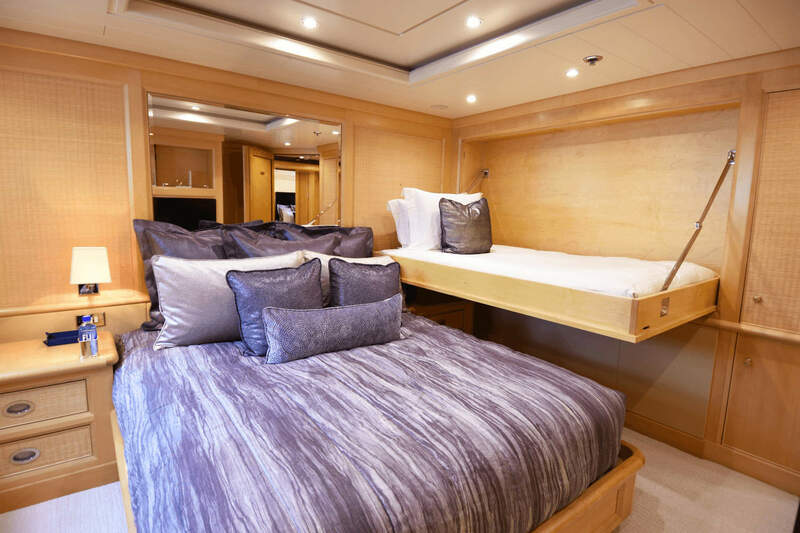 A further two Guest cabins below decks to starboard have a Queen sized bed, an ensuite with shower and a 25 inch Plasma TV & DVD & CD & Stereo. 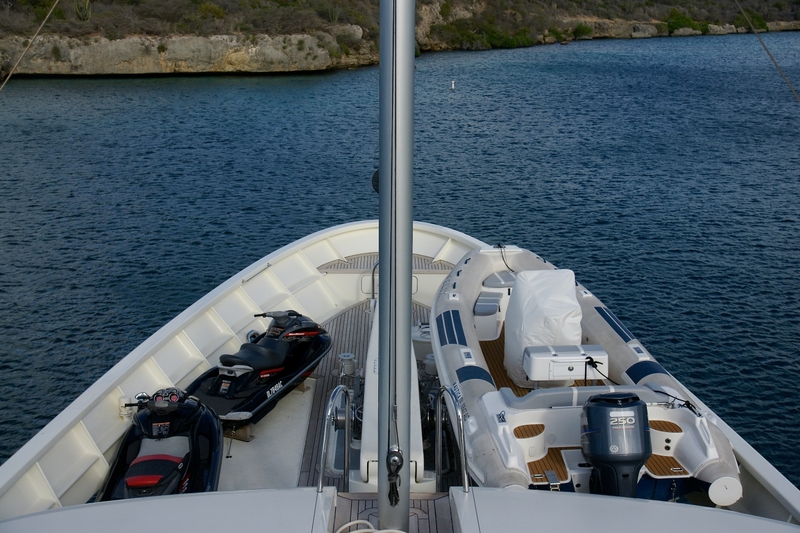 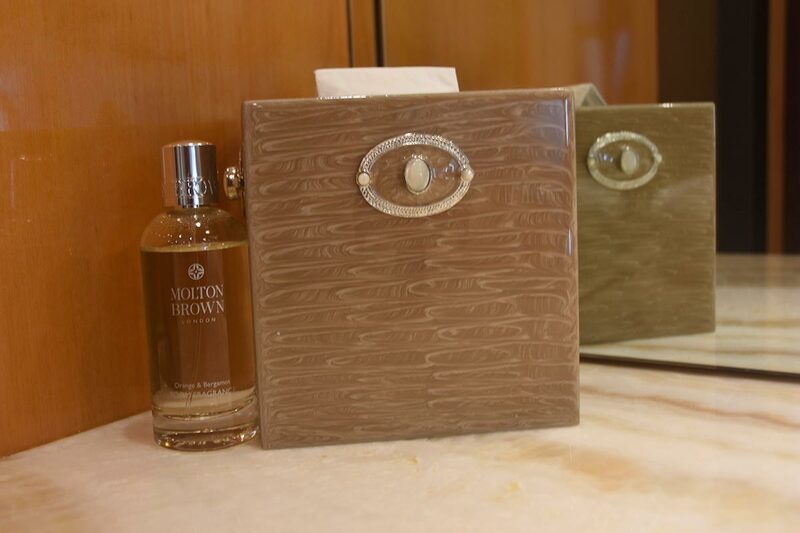 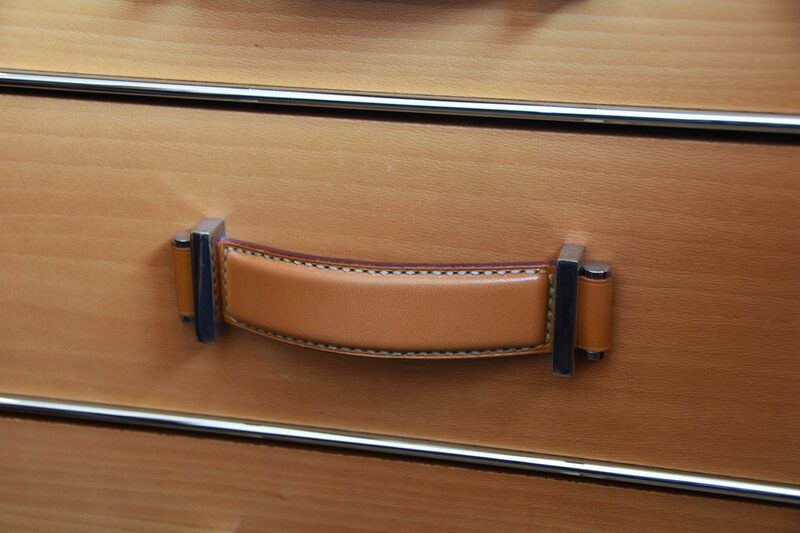 Each cabin is equipped with a safe. 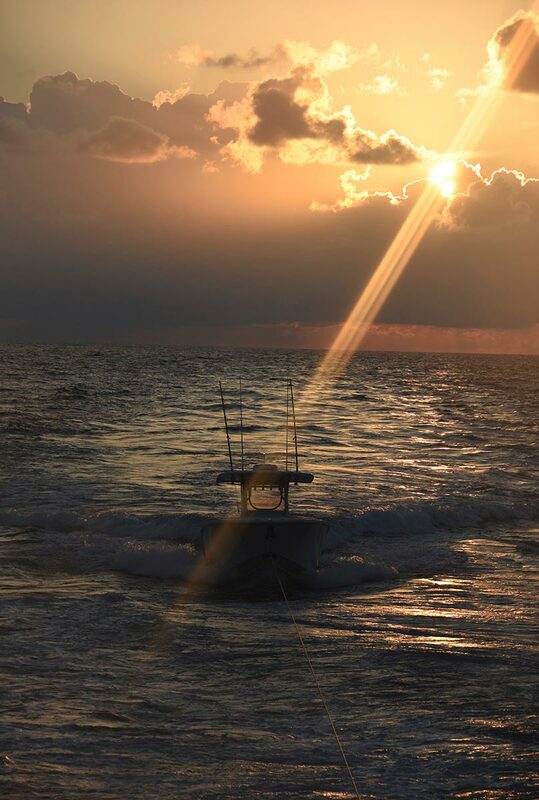 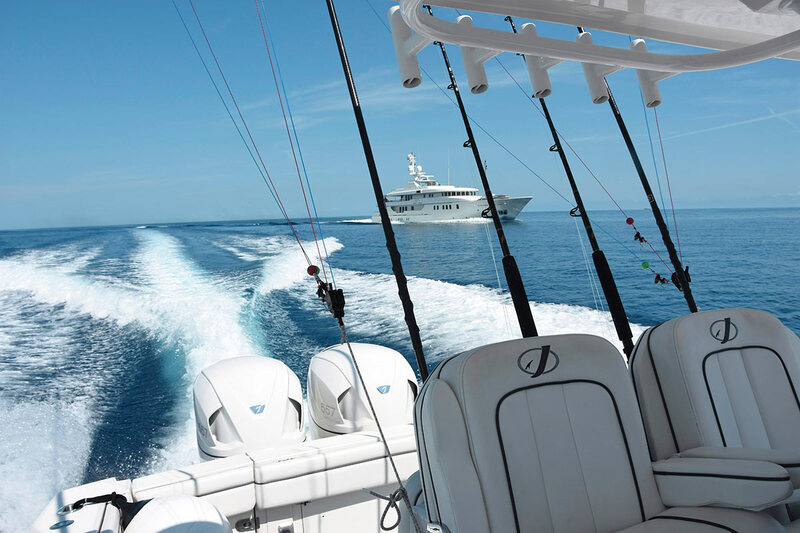 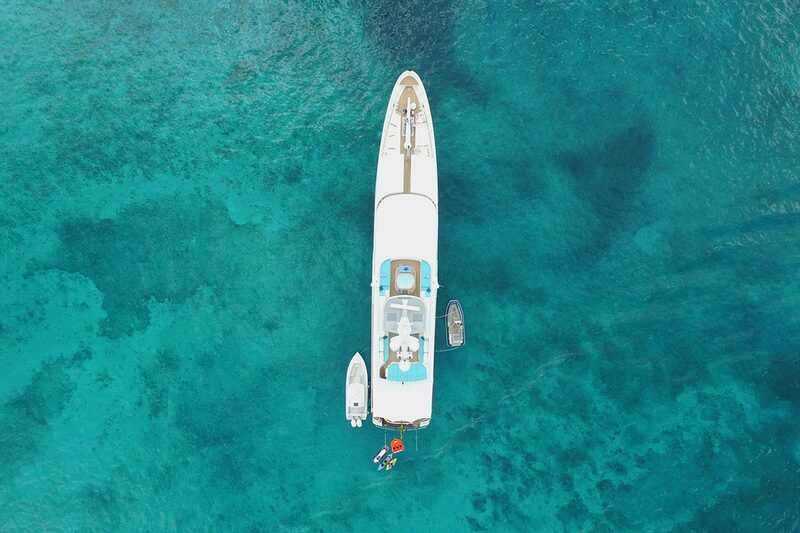 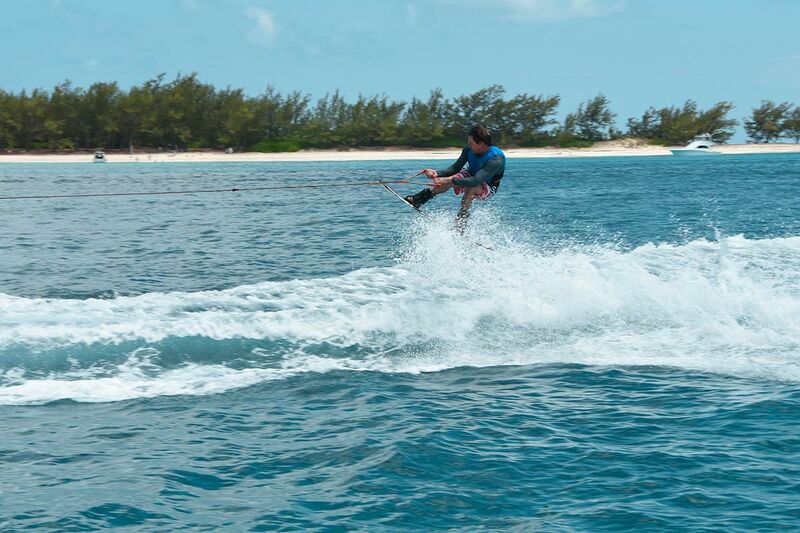 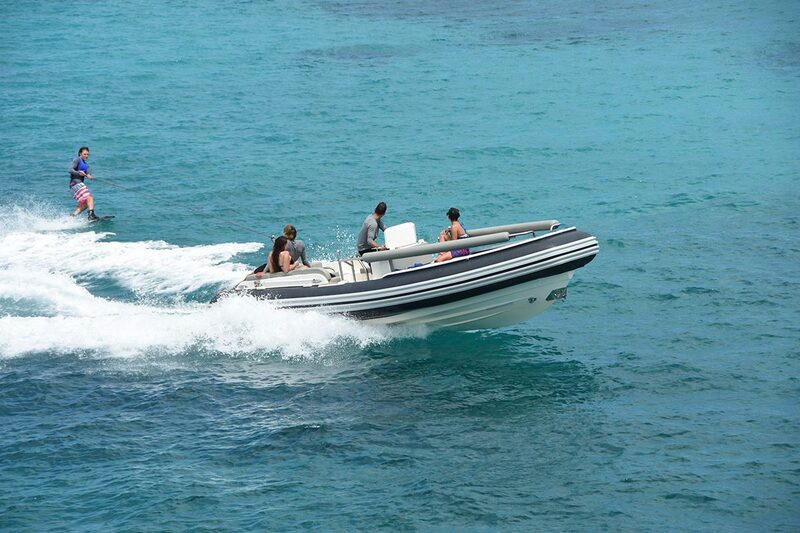 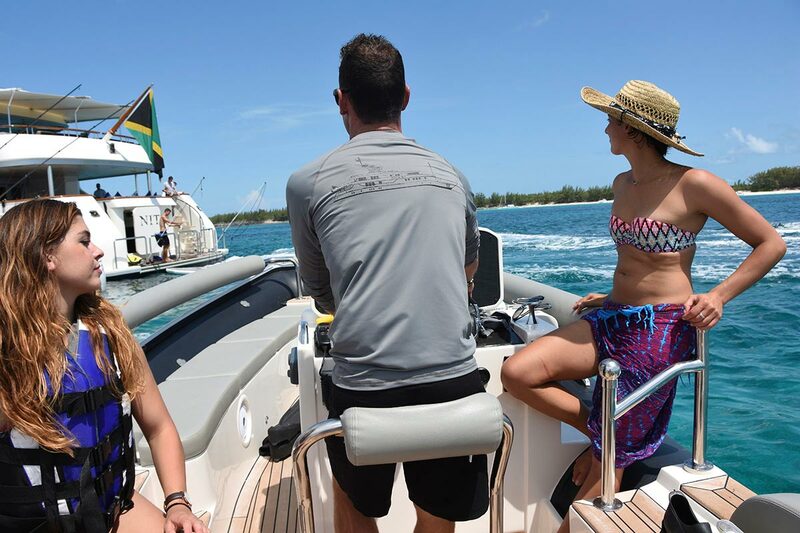 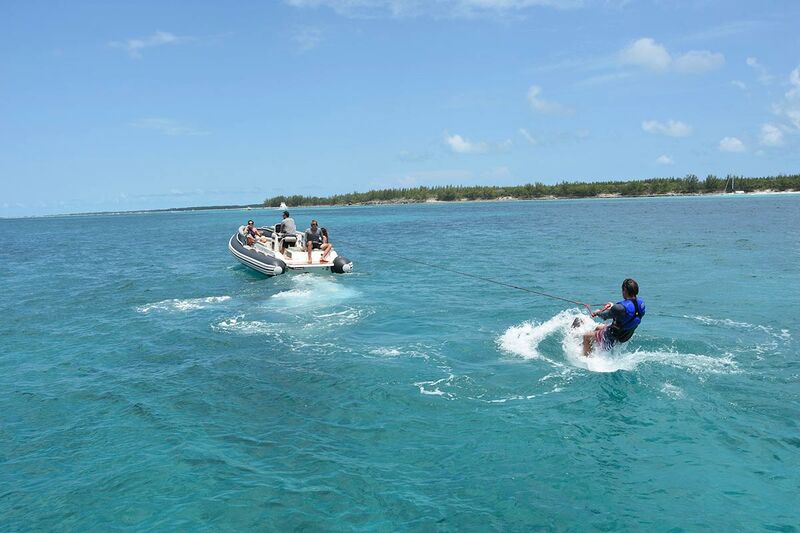 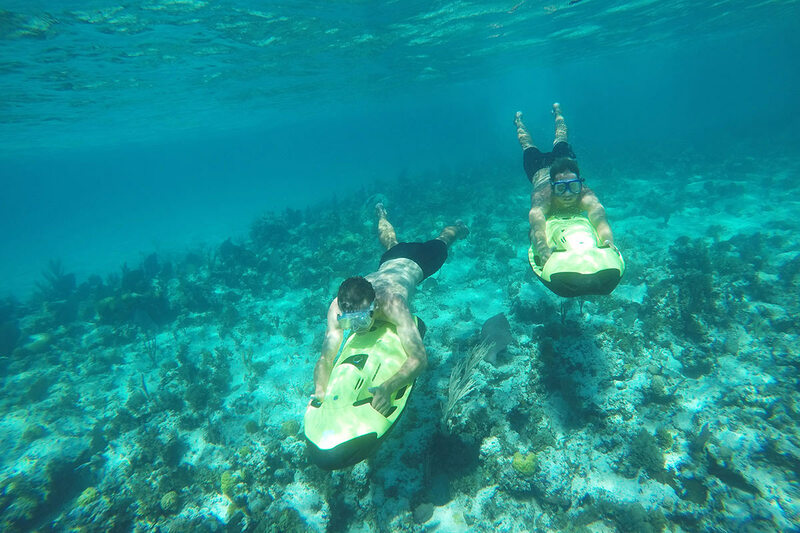 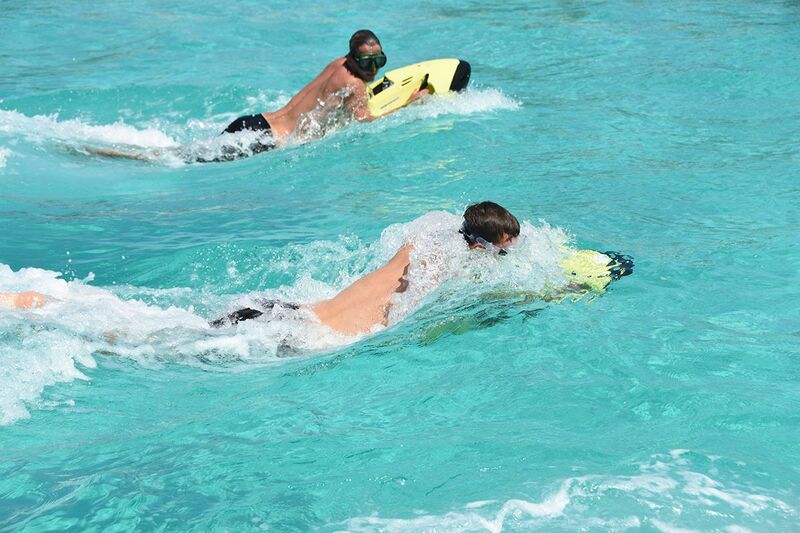 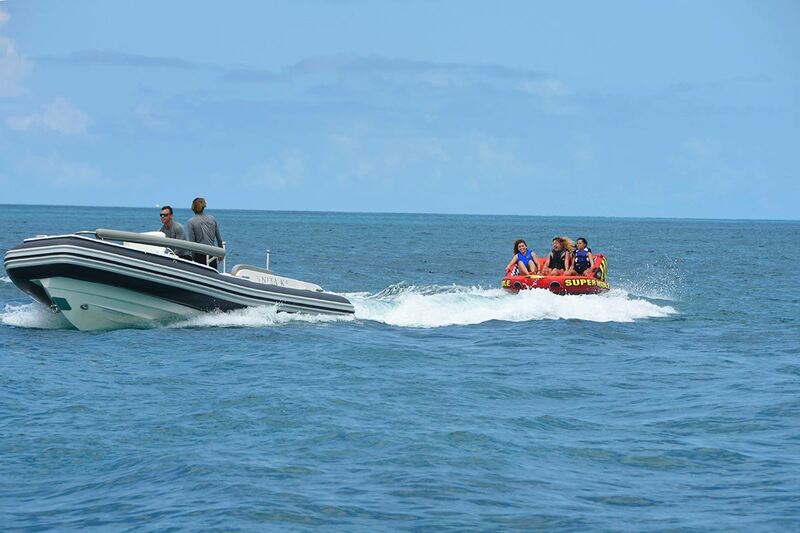 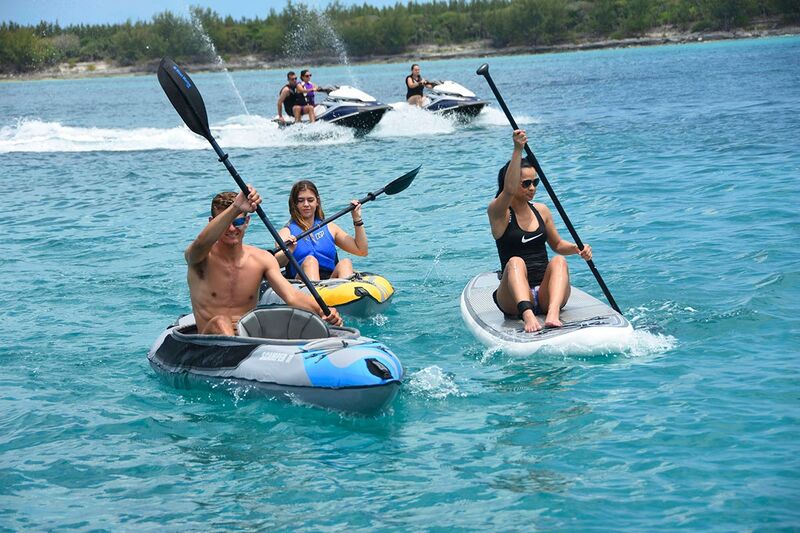 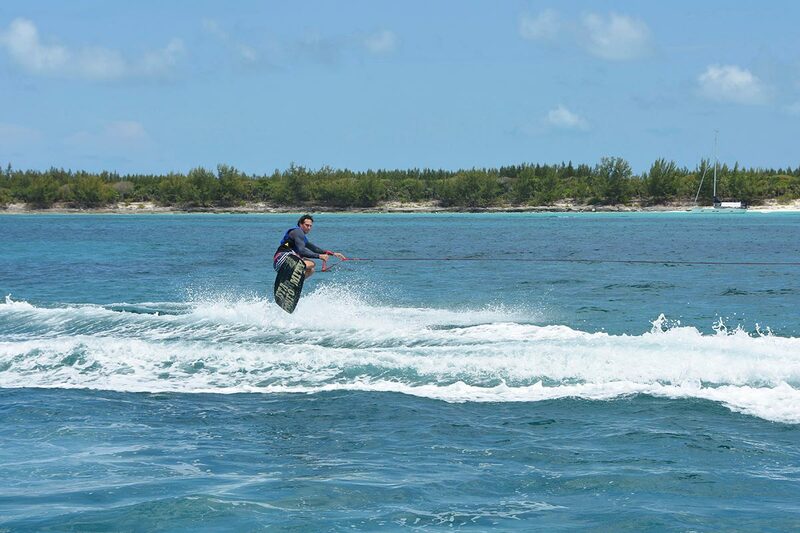 Luxury yacht NITA K II provides guests with the following amenities and extras: Tenders & Toys (2) 22' custom RIB tenders w/ 250 Hp engines; 2-person WaveRunner; 3-person WaveRunner; water skis; wakeboard; snorkel gear; inflatable kayaks; misc. 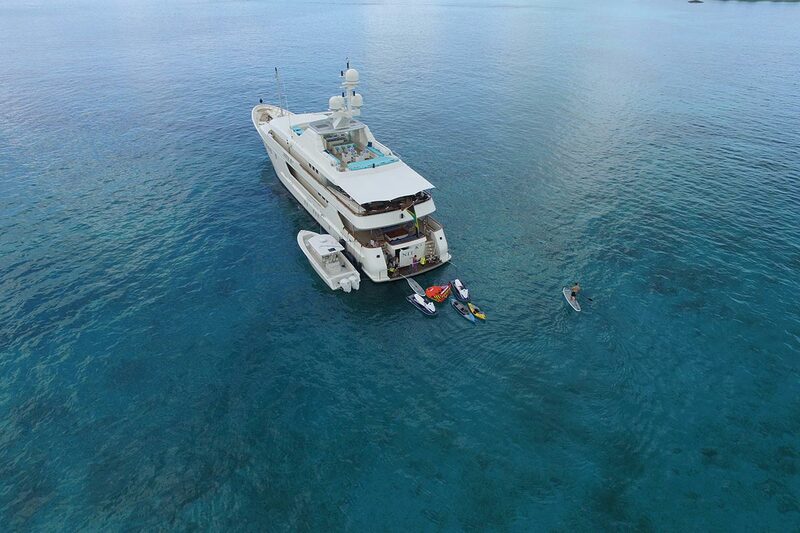 towables and beach toys. 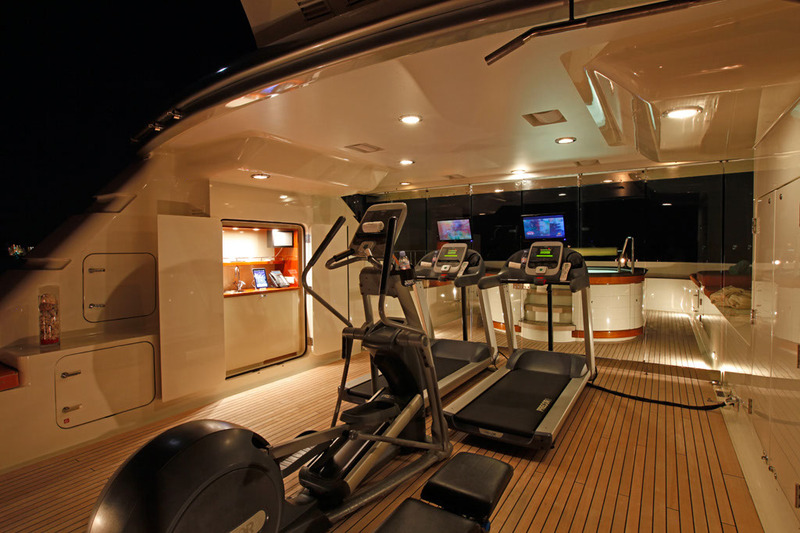 Gym Equipment: Treadmill; step machine; 2 x elliptical machines plus numerous free weights. 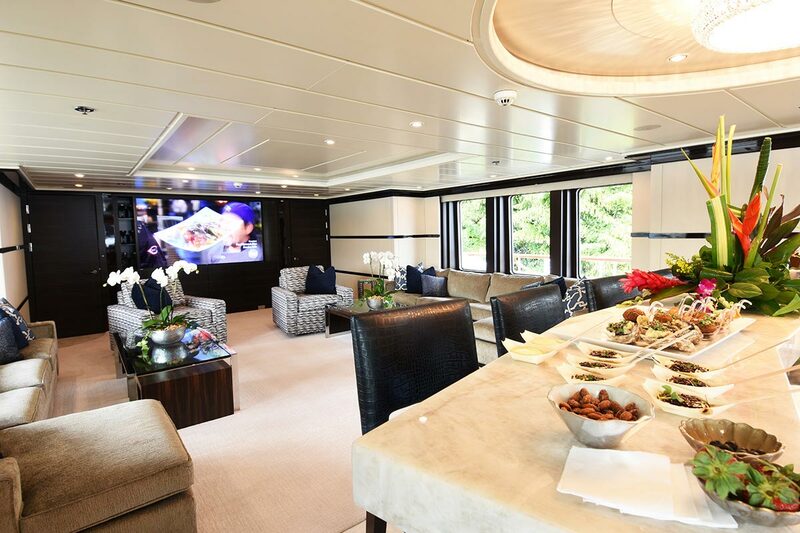 Entertainment: Satellite TV - mini M, Sky, Video & DVD libraries,CD/DVD players X-Box connected. 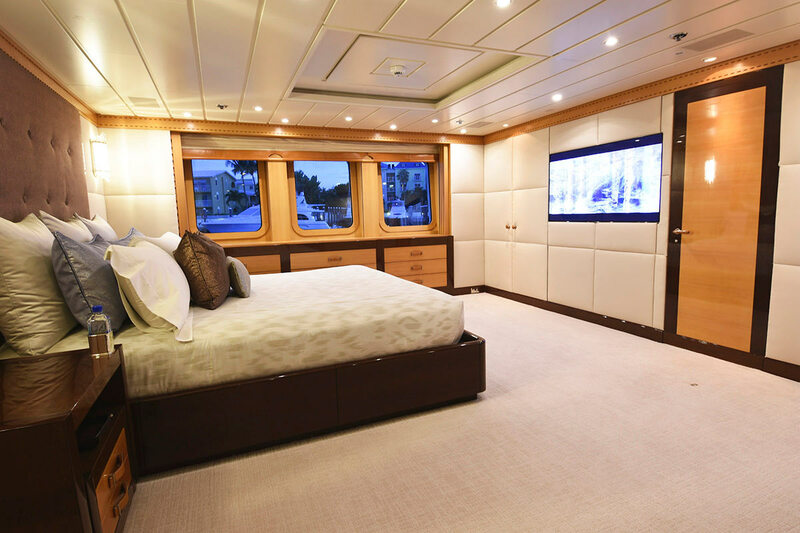 DSS-Digital Satellite System w/ 5 receivers, Crestron Remote System Communications include Wireless high-speed D-Link internet all throughout. 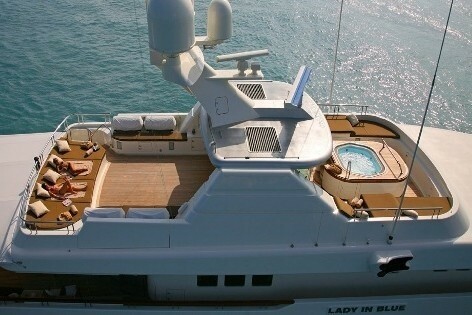 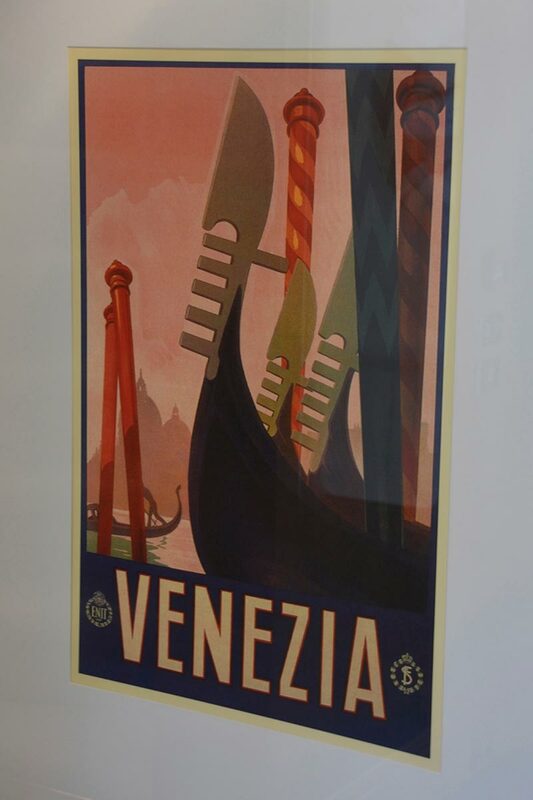 All Satellite Communications throughout, shore line. 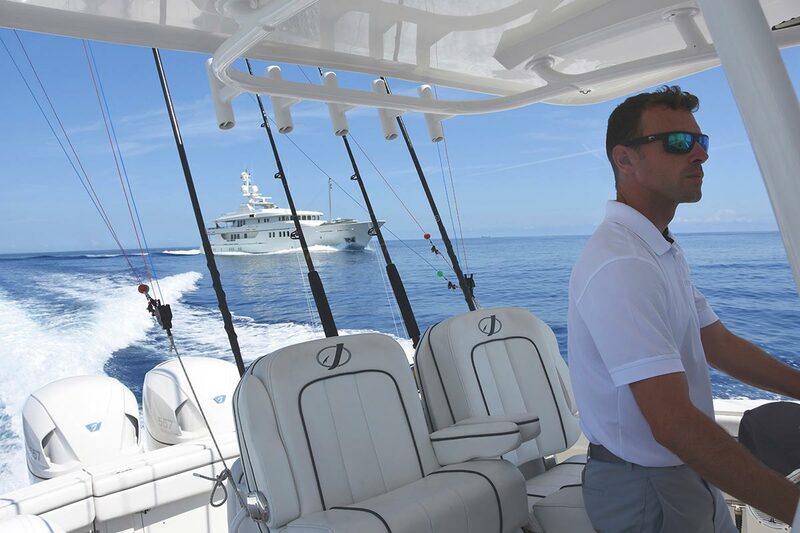 2 satellite Sea Tel phones for voice & data.